The following story is based on actual events. I have tried to recreate events, locales and conversations by connecting the dots of the available data from actual historical events, watch case numbers, movement serial numbers and dial reference numbers. Some details are the result of conversations with Maria Teresa Panerai and other relevant people. This story is not intended to be exhaustive. Incidents, characters and timelines have been created for dramatic purposes. Certain characters and events may be composites, or entirely fictitious. Giuseppe Panerai was sitting at the desk in his laboratory. His door was closed, a clear signal to his employees not to disturb. Giuseppe was a very quiet person who enjoyed immersing himself completely into his work, especially during the hard times Italy was facing at the moment. For the past 11 months, Italy had become a savage battle ground. After the Allied landing in Sicily and a massive Allied bombing of Rome in July 1943, the Italians grew weary of the war. The conflict had turned completely against Italy. 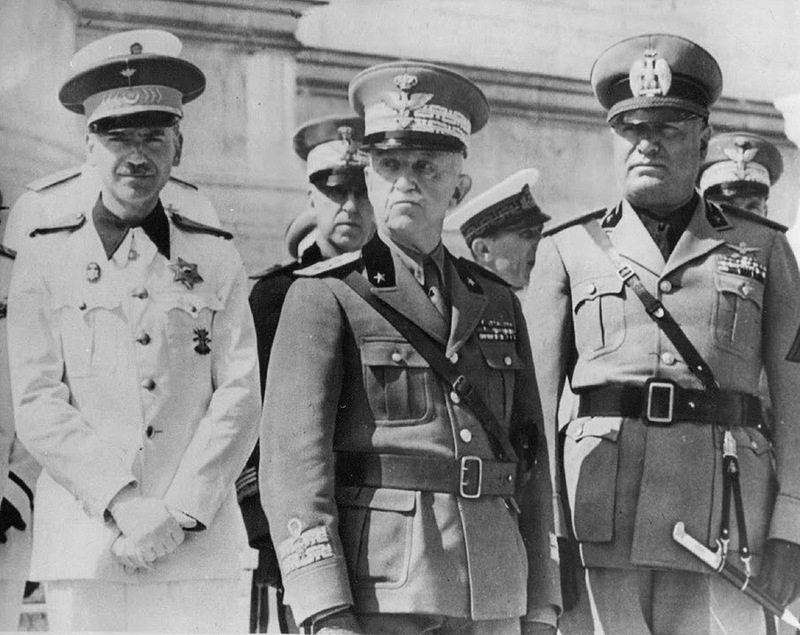 The Italian king Vittorio Emanuele III ousted Mussolini from power and signed an Armistice with the Allies in September 1943 in an attempt to prevent further damage. 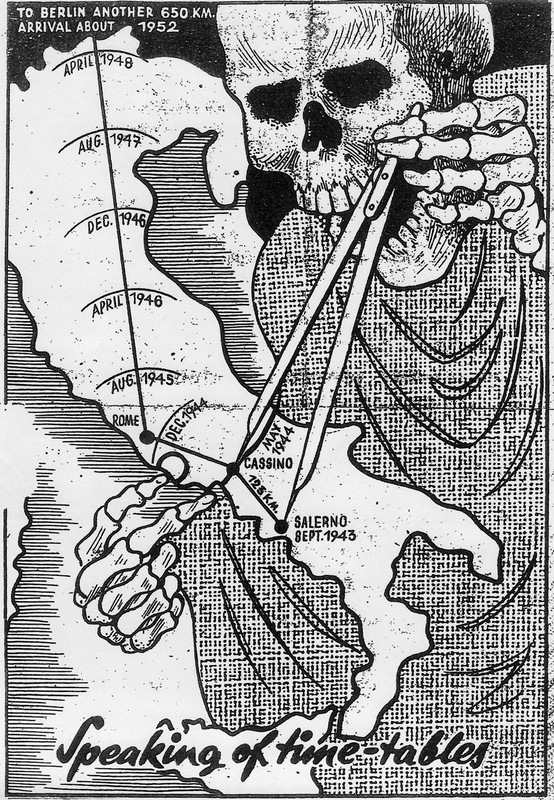 In consequence, Nazi Germany immediately invaded Italy and occupied large parts of the country. The real tragedy had only just began. A massive Allied invasion force landed in Salerno, but their advancing came to a complete halt at the heavily fortified “Gustav Line”, 150 kilometres South of Rome. Eventually, and after heavy losses and over 150,000 casualties on both sides, the Allies managed to break through. The British 8th Army was now relentlessly advancing towards Florence. It was only a matter of time until the city would be liberated… but at what cost? Giuseppe was very concerned. Giuseppe Panerai’s laboratory was located in the back of the Villino Panerai, facing the courtyard in the north-east. Giuseppe’s father Guido built the large town house during the 1920s. The building was divided into two wings. The residence of the Panerai family was located in one wing, while the headquarters of G. Panerai e Figlio were housed in the other wing. All of a sudden, Giuseppe heard the loud noise of heavy trucks stopping in front of his house. Seconds later he spotted armed German soldiers storming into his courtyard and surrounding the building. Giuseppe’s worst nightmare had become reality! While leaving his laboratory, Giuseppe heard loud bangs against the front door. A familiar German voice ordered to open immediately. Two of Giuseppe’s employees were already at the door waiting for his instructions. 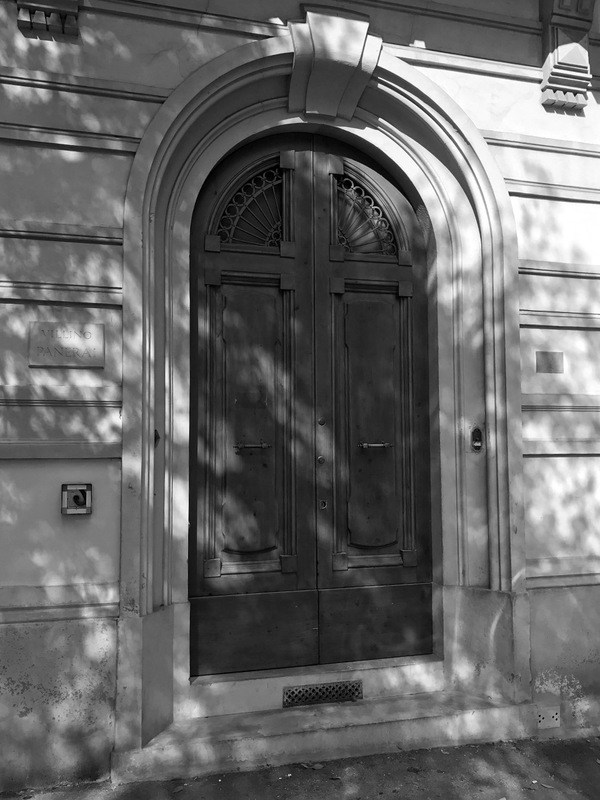 Giuseppe nodded and the door was opened. Four German soldiers immediately stormed into the buidling pushing the two employees aside, followed by Lieutenant Commander Heinz Schomburg. Giuseppe knew this man. 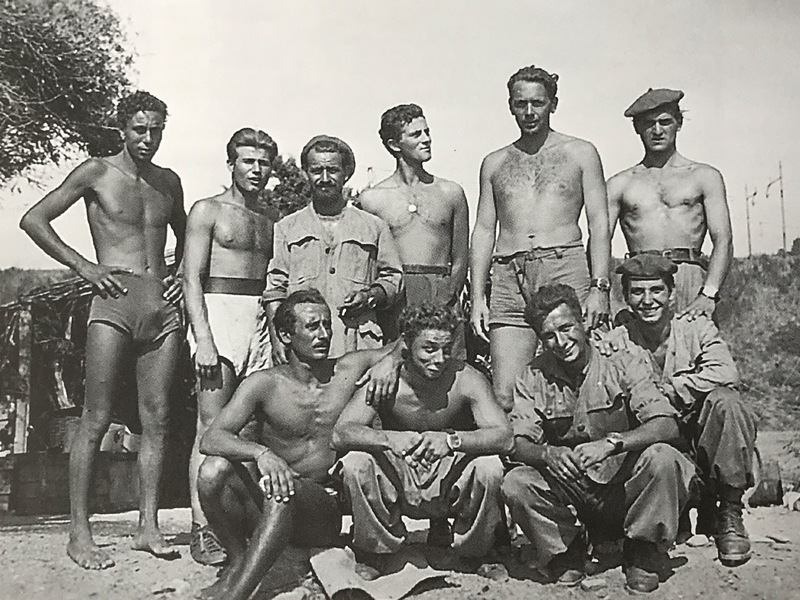 Schomburg was in charge of the Kampfschwimmers, the German combat swimmer unit that was receiving practical training from Decima MAS members who remained loyal to the Axis. Giuseppe recalled several unpleasant encounters with Schomburg. Schomburg came for the first time to Florence to collect a batch of underwater watches that had been ordered and paid for by Decima MAS. Giuseppe later received information that the whole lot had been distributed among the German unit. The Decima MAS had not received a single watch. Three weeks later, Schomburg showed up again and requested 300 watches (~ 260400 – 260700) and dozens of compasses. Giuseppe couldn’t believe his ears but as the accountant he was, he told Schomburg the approximate sum this order would cost. Visibly annoyed, Schomburg unbuckled the holster of his Luger pistol to intimidate Giuseppe. “There will be no payment, Panerai.” Giuseppe was shocked. 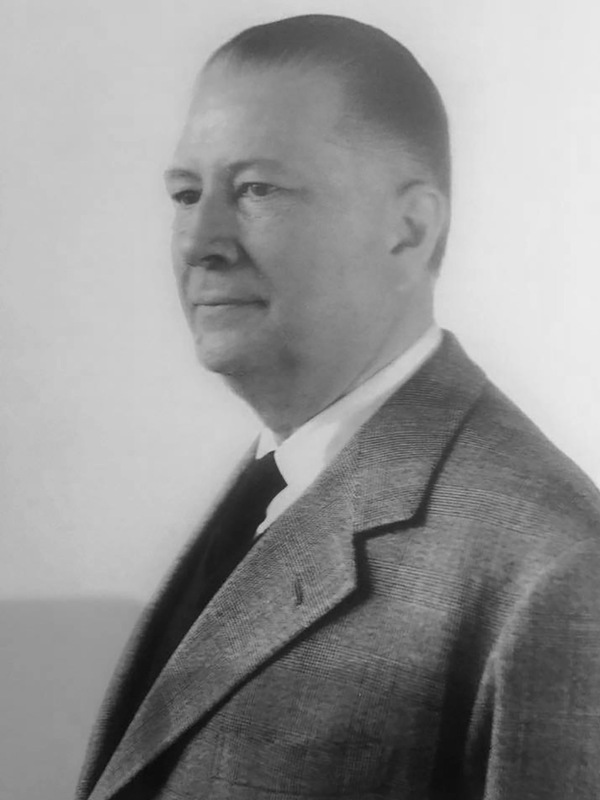 Schomburg also threatened Giuseppe if the deadline was not met, he would be considered a saboteur to the interests of the Third Reich and face severe consequences, including his family. The next day, two of Giuseppe’s employees were rounded up by German troops and arrested under false claims of collaboration with the Italian Partisans. Giuseppe rushed to the local German command to vouch for his employees and make clear that without them it would be impossible to meet Schomburg’s tight dealine. They were released after a few days, but this episode showed Giuseppe how serious the situation had become and what was at stake. Giuseppe contacted Rolex in Geneva and placed the order via telegram. Switzerland was in a very unfavorable situation at that time. Trade with the Allies was abruptely cut off after Axis forces occupied Vichy France in November 1942. The Swiss were now completely surrounded by territory controlled by the Axis Powers, which made them extremely dependent upon Nazi Germany. Switzerland has no natural resources and had to import almost everything. Swiss watch brands had to accept watch orders from the German armed forces in order to survive. 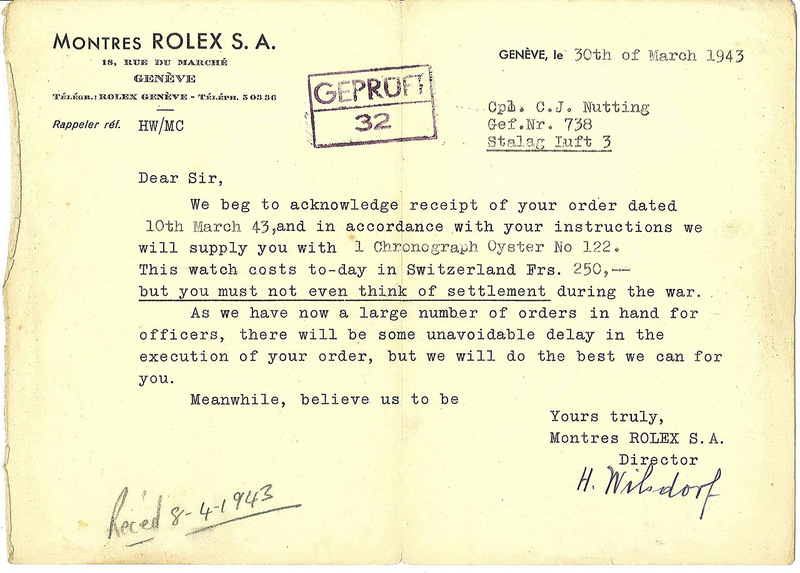 Rolex strictly refused doing business with Nazi Germany. 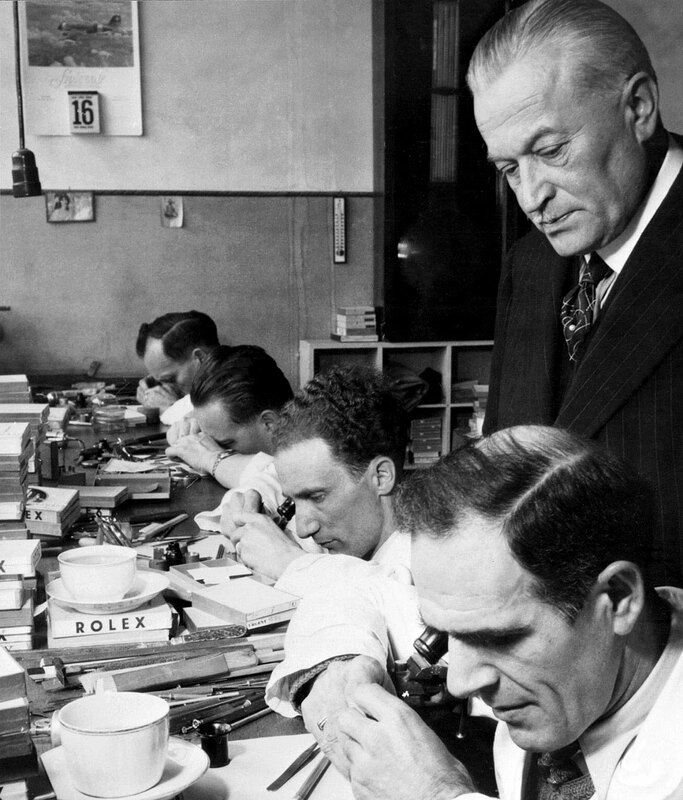 Hans Wilsdorf, the founder and chairman of Rolex, was of German descent, but British at heart. When Wilsdorf learned that the watches of British officers in German captivity were confiscated, he offered free replacement. He managed to get in touch with the POWs (Prisoners of war) through the Swiss Red Cross. Payment for the watches was not required until after the end of the war. This astonishing offer gave POWs hope. Thousands of Rolex watches were sent to POW camps in Germany. This was a very clear statement of Hans Wilsdorf. Panerai was one of Rolex’s earliest and best retailers in Italy. Rolex must have been thrilled to get the chance to supply the first ever diving tool watch. The experience gained in the field was invaluable and ultimately led to the development of the iconic Rolex Submariner many years later. The first batch of Ref. 3646 watches (Type A) had been sent to Florence in April 1940, 2 months before Italy declared war on Britain and France. Wildsorf’s 63 year old wife May Wilsdorf-Crotty was terminally ill when Panerai’s new order came in. Wilsdorf spent most of his time by her bedside. During this difficult period, the company was run by his most trusted employees. Since Panerai was a reputable client, the order was processed without questions. Rolex instructed Cortebert, the movement manufacturer, to produce 300 Cal. 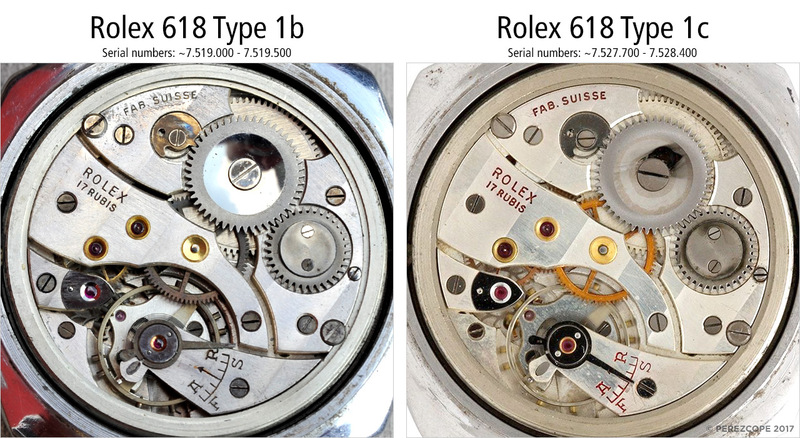 618 high grade movements (Rolex 618 Type 1b, ~ 7,519,000 – 7,519,500). These new calibers had slightly different engravings compared to older Type 1a movements. 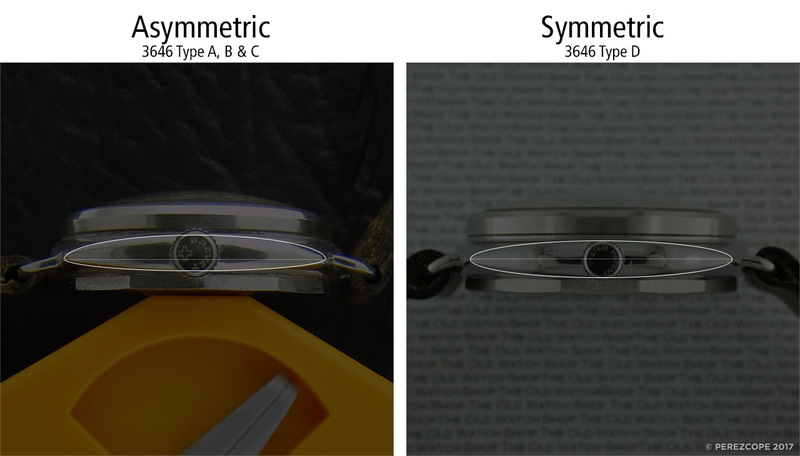 The case design was simplified in order to process the high number of watches as fast as possible. The profile of the new cases was now completely symmetric compared to the first cases delivered between 1940 and 1943. 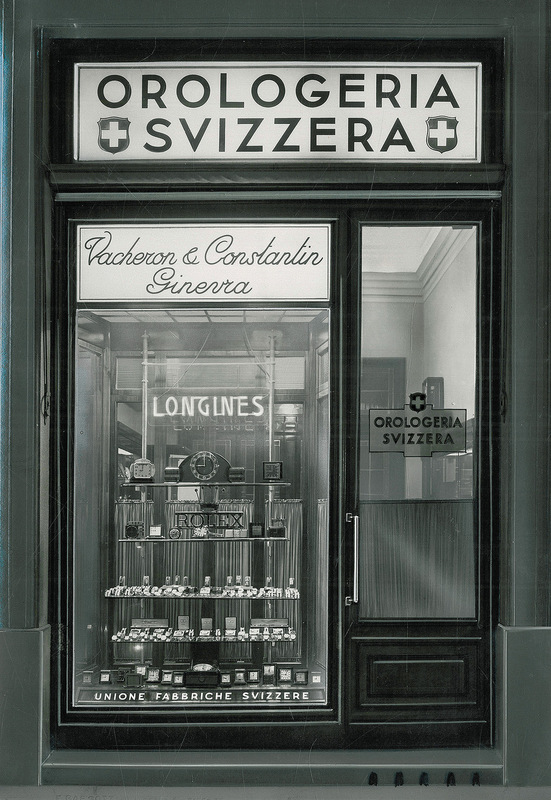 Only two weeks later, Schomburg contacted Giuseppe again and ordered another 400 watches (~ 260701 – 261100). Giuseppe placed the new order immediately. 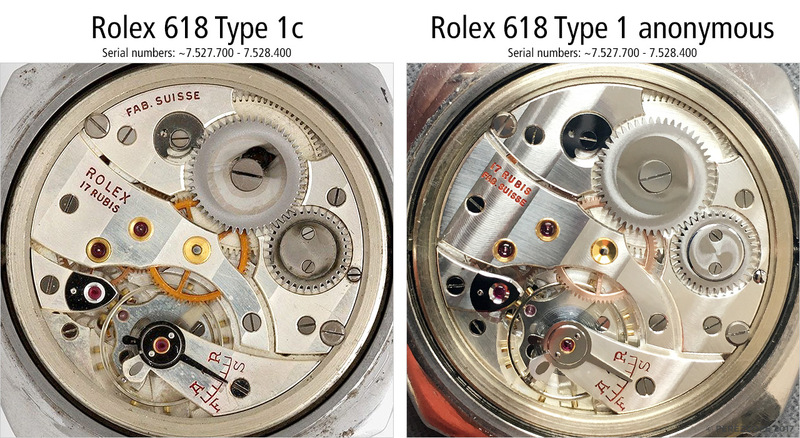 Rolex managed to keep the serial numbers for the entire batch of 700 pieces continously (~ 260400 – 261100). Cortebert, however, had already moved on with their production and the new batch of movements was from a different serial number range (~ 7,527,700 – 7,528,400). 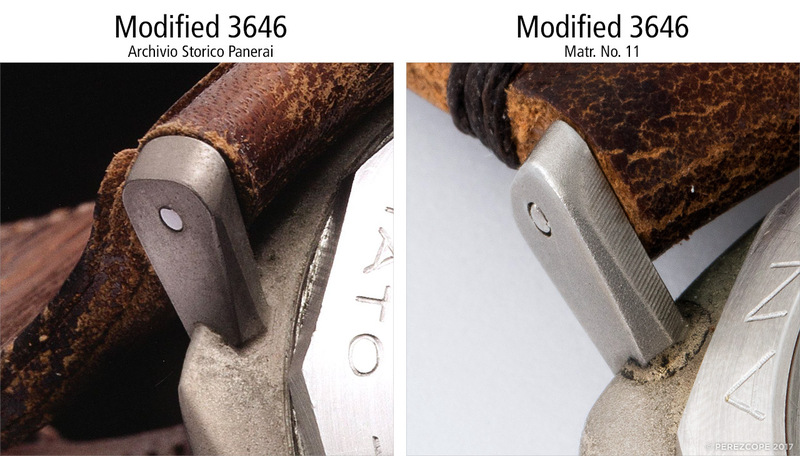 Movements from this serial number range received a different surface plating (probably rhodium) which offered a better protection against corrosion. Earlier movements were nickel-plated. 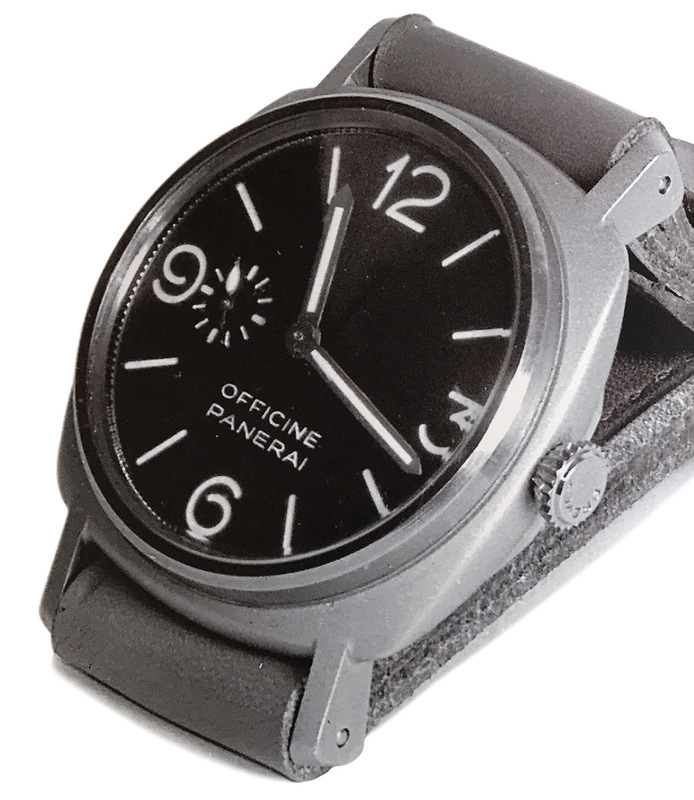 Panerai started with the production of their highly luminous Radiomir dials. The dial construction was intricate and the rejection rate was high. After around 350 dial blanks, the company ran out of aluminium. Giuseppe had always insisted in having the name of his company engraved on everything that was produced in-house. He had a great eye for typography and his pantographers were true artists. However, due to the nature of this particular order, Giuseppe didn’t want his name on the dials and decided to keep them anonymous. His decision reduced the work load considerably and had also another positive side effect. 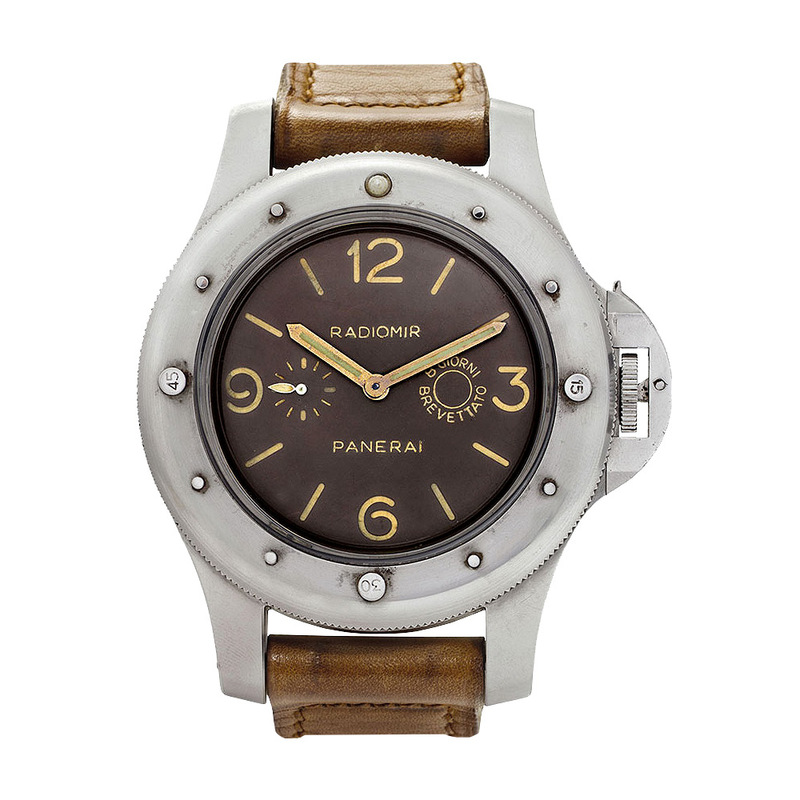 Panerai would not be in the spotlight in the event German Kampfschwimmers were captured by the Allies. Panerai’s aluminium stock was exhausted and new aluminium was impossible to source. The Germans were confiscating every bit they could find. They were even taking apart Italian aircraft carriers in order to salvage as much aluminium as possible. German warplane and rocket factories were insatiable. Giuseppe had to improvise and asked Rolex to deliver the remaining 400 watches with luminous dials of their own production. 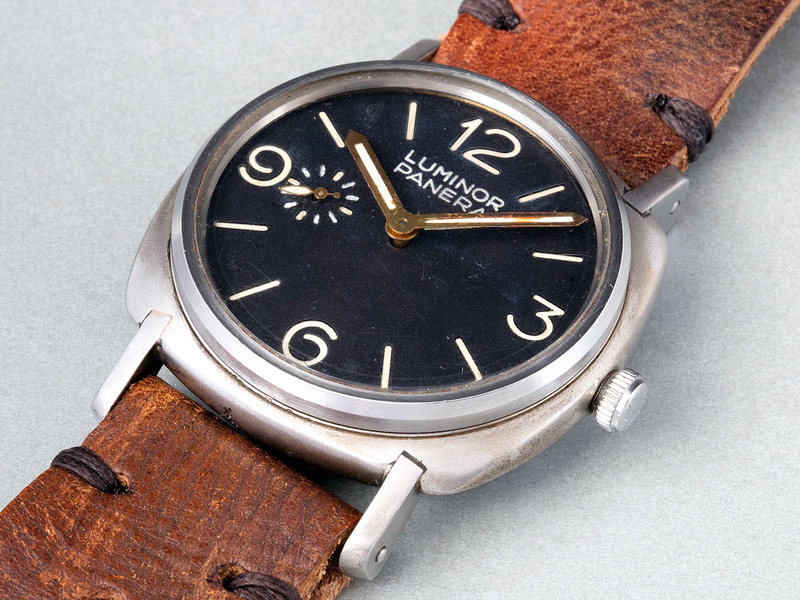 This gave birth to the iconic “California” dial in Panerai watches. Note: Claims that the “California” dial is the original prototype dial from 1936 are not true. This type of dial for Panerai watches was born in 1944. 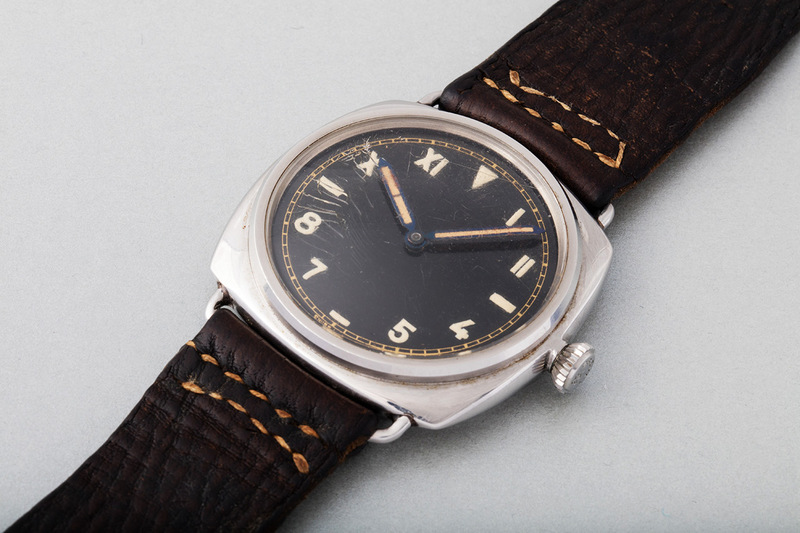 It was designed by Rolex and registered under “Brevet CH 221643” in May 1941. “California” in early 3646s are replacement dials. Schomburg came to Florence to personally pick up the first 450 watches that were ready. 300 pieces had been equipped by Panerai with their Radiomir dial and 150 pieces had the new Rolex dial (California). The latter had been delivered with low bezels. Schomburg was not amused over the new dials, as they were not very luminous compared to Radiomir dials, but he was well aware of the aluminium issue and accepted the whole lot. Hans Wilsdorf’s wife, May Wilsdorf-Crotty died on April 26, 1944. Hans Wilsdorf was devasted and required several weeks to somewhat recover from his loss. When he focused on his work again, he became aware of Giuseppe Panerai’s last order. Hans Wilsdorf knew the situation in Italy and was very concerned his watches may have ended up in German hands. He needed certainty. He contacted Giuseppe and voiced his concern. When Giuseppe confirmed that the watches were destined for the Nazis, Hans was furious. He feared for his company’s reputation and decided to stop the supply immediately. However, Giuseppe managed to make him understand what was at stake. 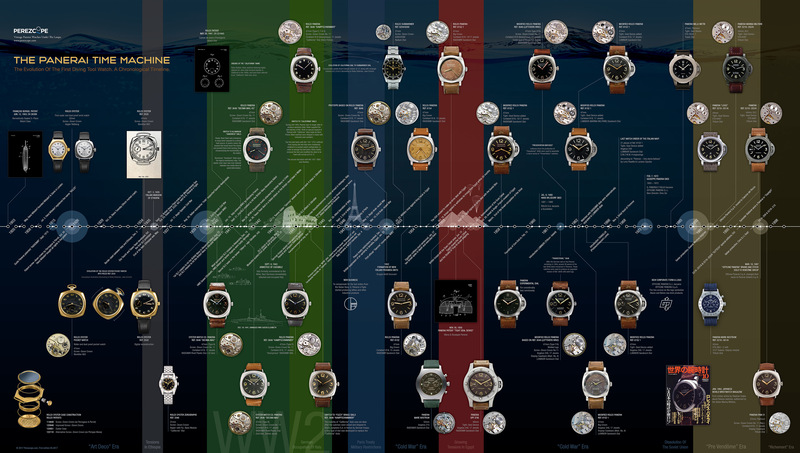 Wilsdorf understood Panerai’s plight, it was a matter of life and death. In order to protect the Panerais and their employees from being harmed by the Nazis, Wilsdorf agreed to keep up the supply. At the same time he took appropriate measures to conceal the provenence of the watches. Just like Giuseppe, Wilsdorf didn’t want to have anything to do with the Nazis. The case maker C. R. Spillmann SA was instructed to remove the Rolex stamps from all casebacks which had not yet been delivered. 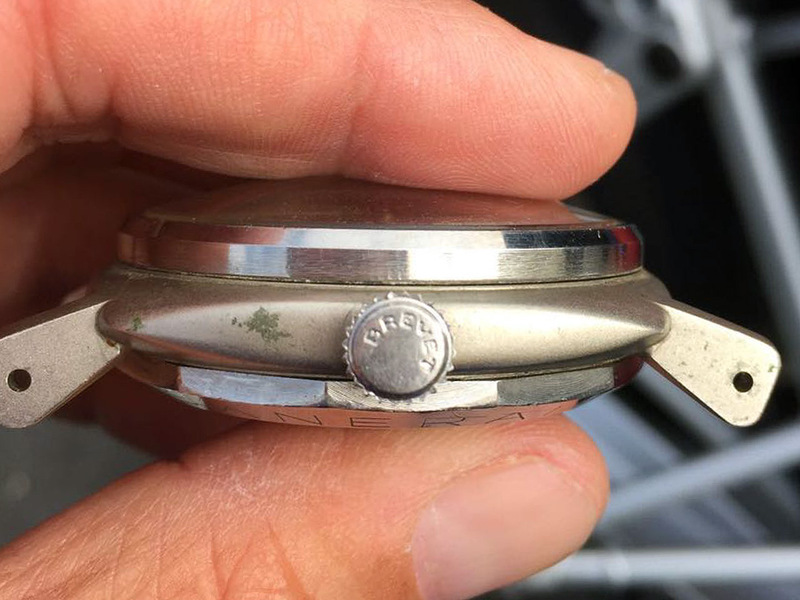 The caseback numbers were restamped at a different position, where the metal was still thick enough to avoid deformation. The first completely anonymous watch was case number 260850. The stamps on the following caseback were not properly removed and are still visible. Rolex also contacted Cortebert, the movement maker, and ordered new movement bridges without the usual Rolex markings. Rolex then replaced the bridges on all movements. 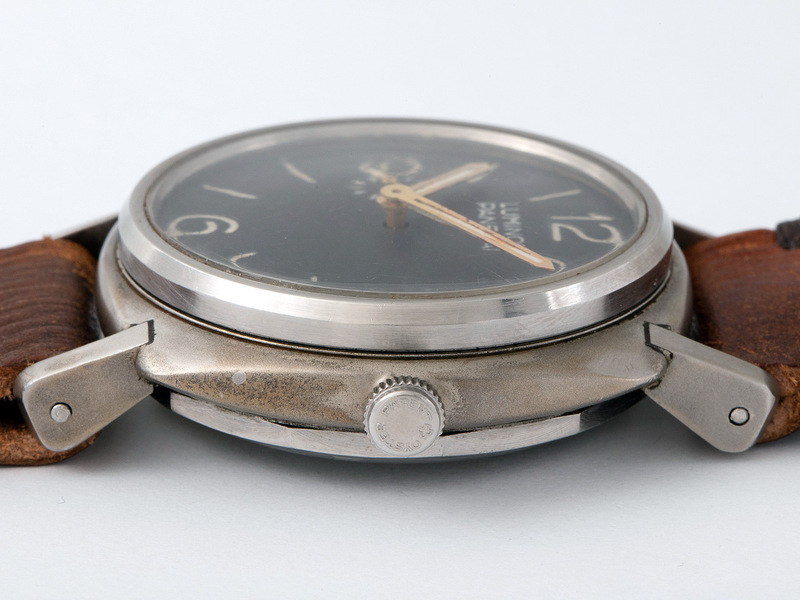 Case number 260873 slipped through this process and retained its original caseback stamps and Rolex marked bridges. Since there was no need to incorporate high Panerai dials, the decision was made the reduce the overall height of the cases in order to save material. 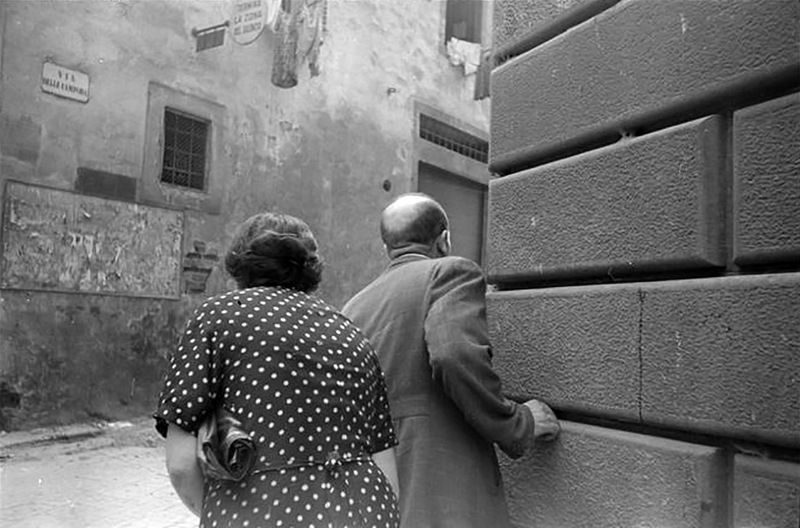 The watches that arrived to Florence now were considerably thinner and most importantly, completely anonymous. Schomburg returned once again to Florence to collect the latest batch and request another 100 watches for his unit. Eugenio Wolk, the commander of the Italian Gruppo Gamma combat swimmer unit in Valdagno, heard of this order. 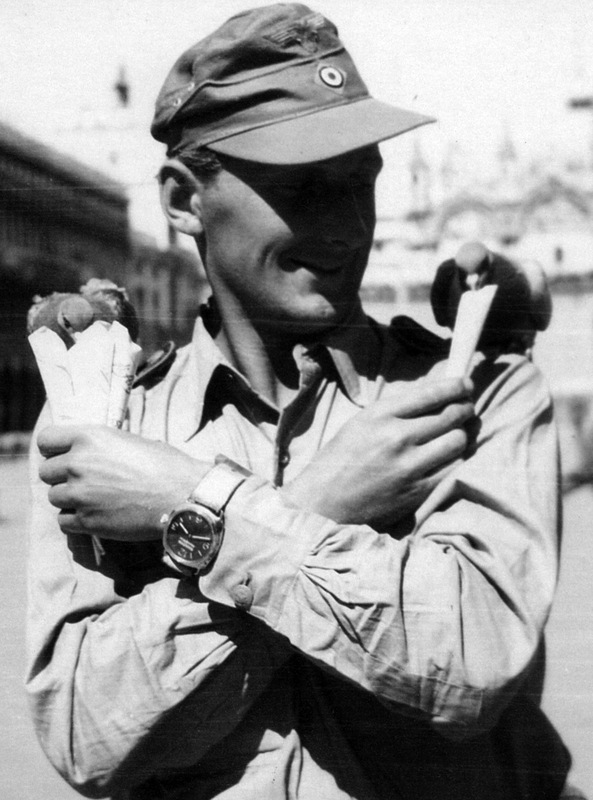 He contacted Giuseppe and asked him to order 35 watches more for new Italians recruits, and hide them from the Germans. Giuseppe disliked the direction the Decima MAS had taken after the Armistice. The unit was now mostly an infantry division fighting against partisans under German command. However, as a true patriot, he complied with Wolk’s wish. Giuseppe hid the surplus of watches behind the lining of an evacuation tunnel that had been built in 1940. The tunnel led from the basement of the Villino Panerai to another basement near the Piazza Edison, a square around 200 metres away. Since G. Panerai e Figlio was a supplier to the Italian Navy and could become a target during the war, Giuseppe took precautions to protect his family and his employees in case of a bombing. Giuseppe was thinking of the extra watches when Schomburg planted himself in front of him. “Panerai, today we will confiscate everything useful to us, machines, tools, you name it. I recomend you to cooperate. Where are the watches I ordered?” Giuseppe pointed to the storage room. Schomburg sent one of his soldiers to check. The room was full of boxes and other stuff. 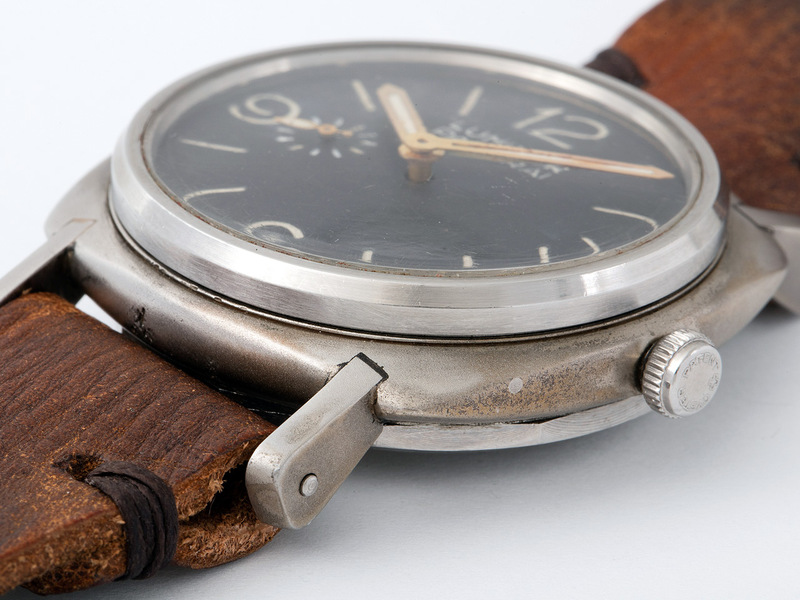 Giuseppe Panerai was known to never throw away anything. “Clear, Lieutenant Commander” the soldier said. “Which box?” Schomburg asked Giuseppe Panerai. Giuseppe walked into the room and showed Schomburg a non-descript wooden box. “This one.” “100 watches as requested?” Giuseppe nodded. A soldier pushed Giuseppe aside and took the box. During the following hours, the Germans checked the whole building for usefull items. They also inspected the evacuation tunnel but didn’t bother to look behind the lining. The soldiers loaded everything they could use, including the lathes, the milling machines, the pantographs and most tools onto their trucks and left. The G. Panerai e Figlio workshops were no more. Maria, Giuseppe’s older sister was crying. She and her brother knew all along this would happen at some point. They had heard the many reports of German lootings in the region. Now it was only a matter of days until the British would reach Florence. The Florentines prayed the Germans would spare the Renaissance’s birthplace and declare it an open city. On the afternoon of July 29, the Nazis ordered the evacuation of all neighbourhoods bordering the river Arno by noon of the following day, Sunday, July 30. 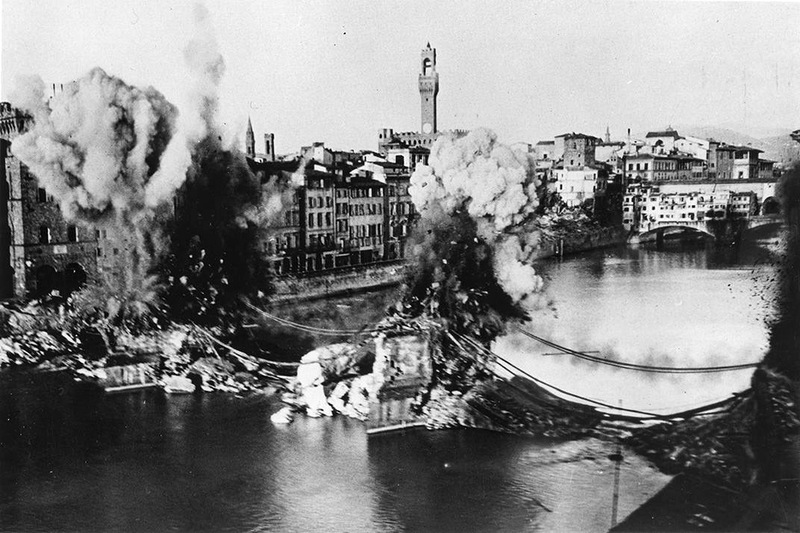 Colonel Fuchs, the German commander in charge of Florence, told concerned citizens the evacuation was a purely precautionary measure, in case of an Allied direct attack on the city. The Allies were close and the Florentines had almost grown accustomed to artillery rumble. On the night between 3 and 4 of August, they heard an explosion like no other before. The tremendous blast shook the ground like an earthquake. Glass and pieces of windows rainded down on the streets. The air became unbreathable. A second blast occurred in a matter of minutes, followed by a number of heavy explosions. The ground did not stop shaking from the force of the explosions. The fiercest blast was heard at five o’clock. 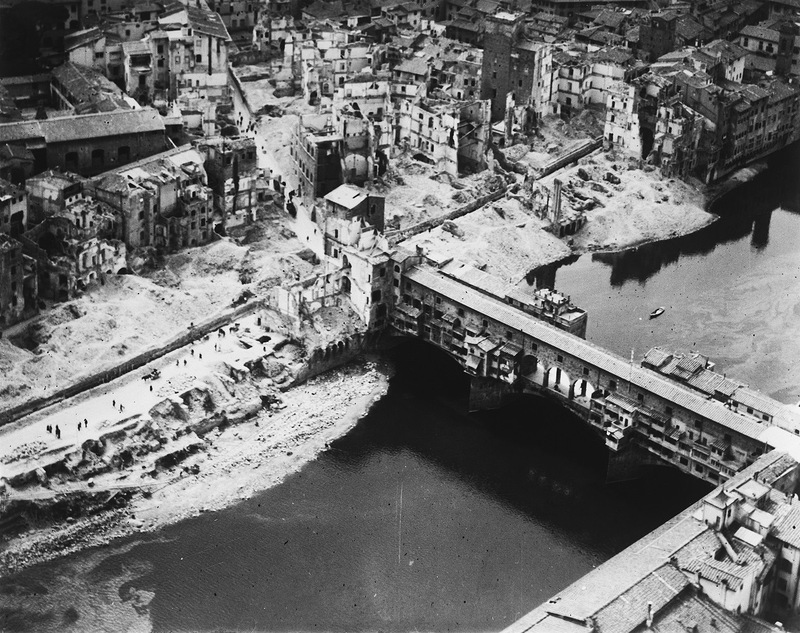 The next morning, the Germans in the South of Florence were gone and with them all historical bridges over the river Arno. 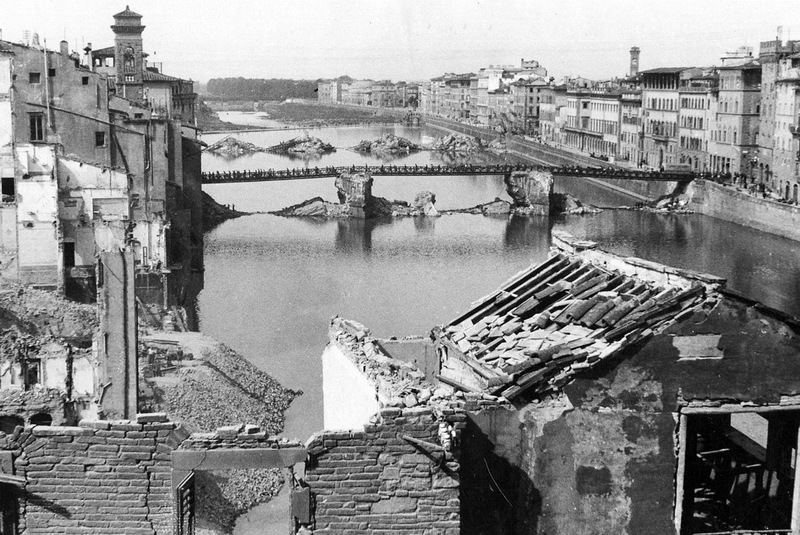 All bridges, except for the Ponte Vecchio, had been destroyed. The medieval Ponte Vecchio and the Vasari corridor on top of it, were spared due to their historic importance, but significant buildings at both ends were destroyed to obstruct the access to the bridge. It took several weeks to liberate the city completely. 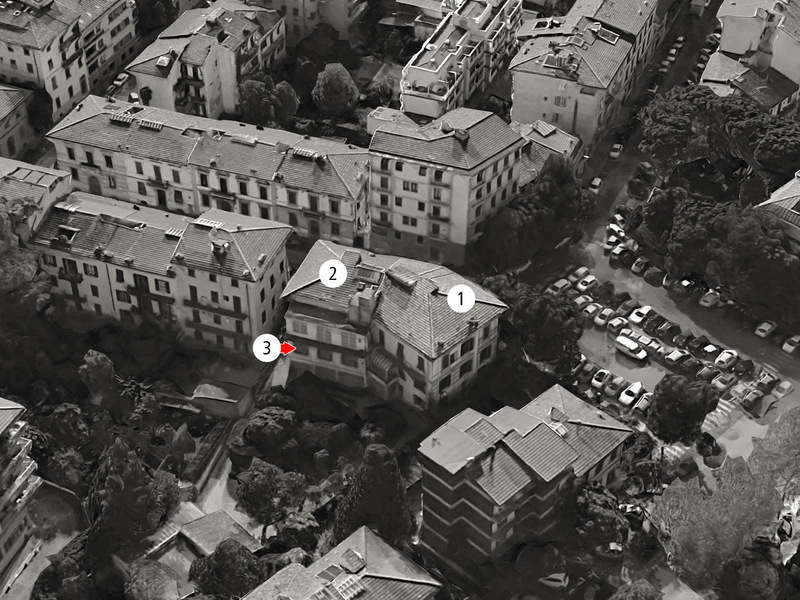 Nazi SS patrols continued to raid the city center just to terrorise the Florentine population, even though the Allies had already reached the southern districts of the city. Young fascist snipers, hidden on the rooftops of the city, wounded and killed hundreds of people. Many years later, in the early 1960s, the world became aware of the significant radiological hazards of Radium lume used in wristwatches and other instruments. All major watch brands switched to Tritium, a less radioactive substance that poses no real threat to human health. Giuseppe Panerai created his own auto-luminous pigments based on tritium and named this new product “Luminor”. The trade mark “Luminor” had already been registered in January 1949. 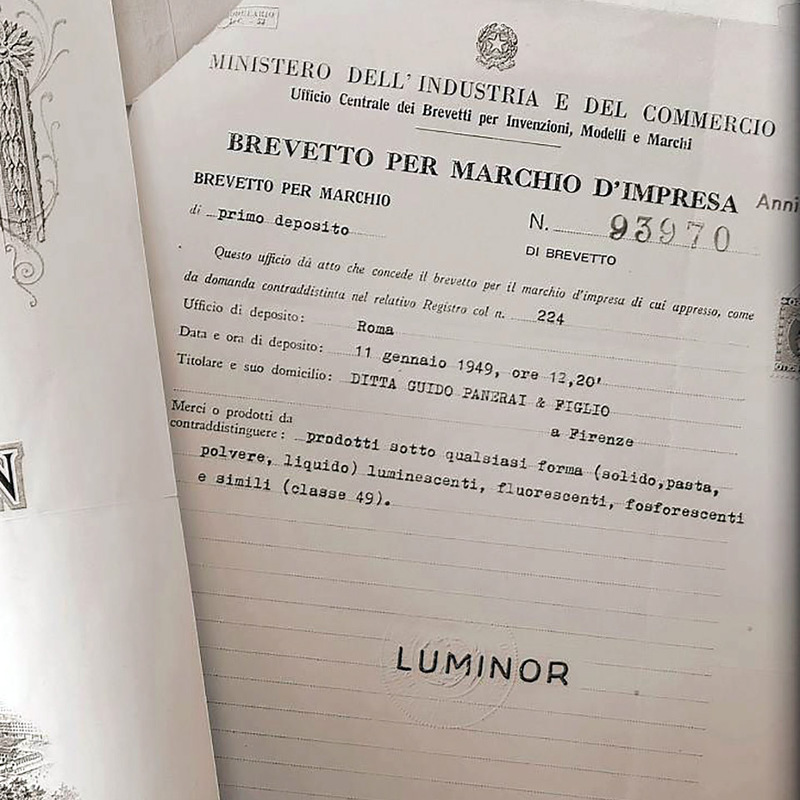 The document below is only a trade mark registration and not a patent for the tritium-based compound “Luminor” as claimed by Officine Panerai. 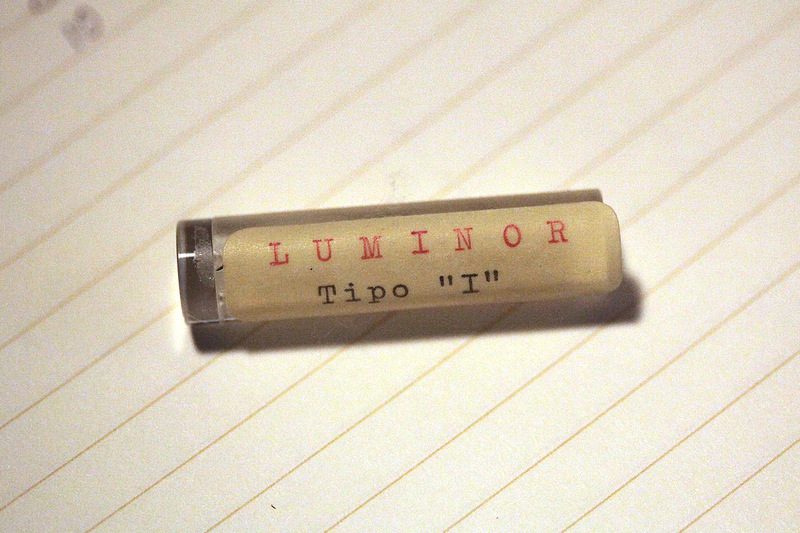 According to the document, the name “Luminor” was reserved for all sorts of luminescent, fluorenscent and phosphorescent products in whatever form (solid, paste, powder, liquid). 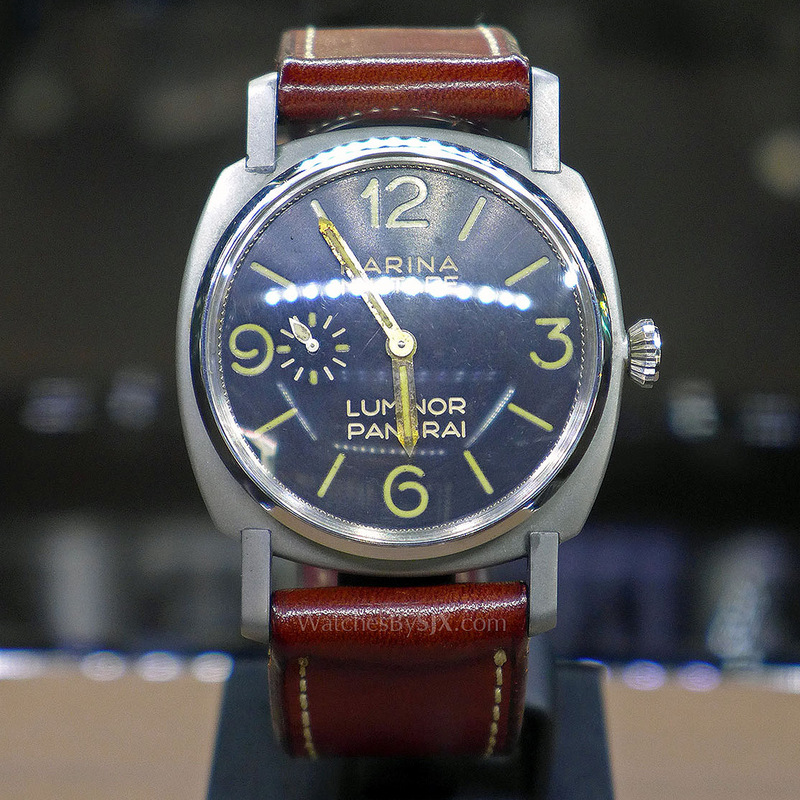 The Marina Militare had already been supplied with a new generation of Panerai watches with lugs carved out of the same solid block of steel as the case. This was in 1953, after the Paris Peace Treaty restrictions imposed after WW2 were revoked and Italy officially started to rebuild its frogman units. The first two Panerai references 6152 and 6154 were produced in small numbers only to test their performance under real life conditions. As a result, a simplified version of ref. 6152 was developed, ref. 6152 1. Giuseppe ordered 500 pieces from Rolex and started supplying the first watches in 1956. These watches were equipped with highly radioactive Radiomir dials. The same year, Giuseppe welcomed a new client to its company’s portfolio, the Egyptian Navy. Since G. Panerai e Figlio had an exclusivity agreement with the Italian Navy, the deal had to be approved by the highest levels of the Marina Militare first. 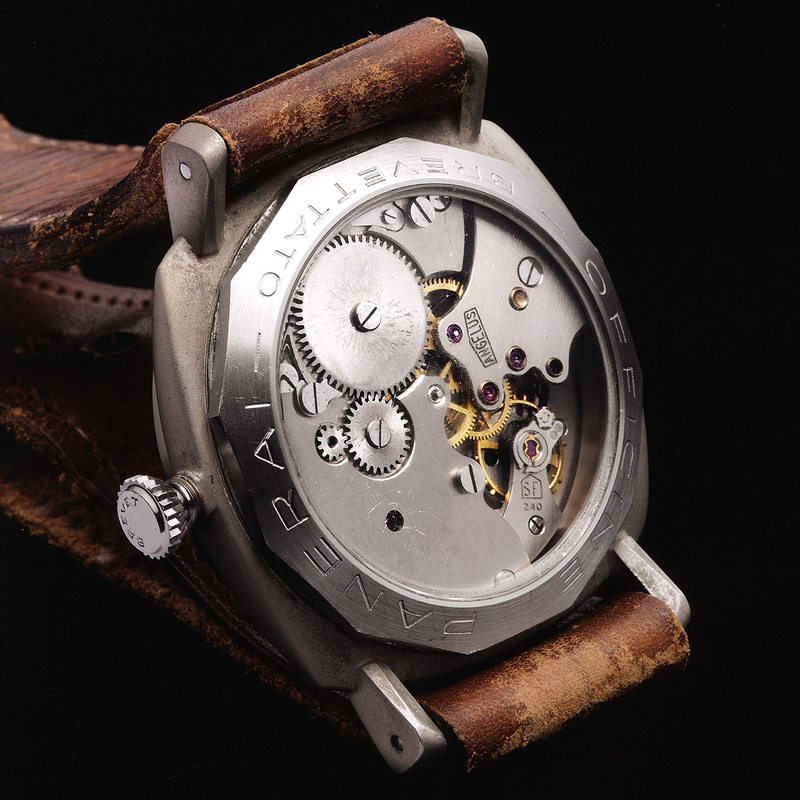 This cooperation gave birth to the GPF 2/56, the first completely in-house developed and manufactured Panerai watch. The number 2/56 probably refers to the second project in 1956. Panerai decided to use an elaborated version of the Angelus 240 8-day caliber made by Stolz Freres in Le Locle, Switzerland. The massive case of 60 mm diameter was equipped with an ingenious invention, the “Tight Seal Device” which was patented on Nov. 30, 1955. Panerai introduced the “Tight Seal Device” also on ref. 6152/1. 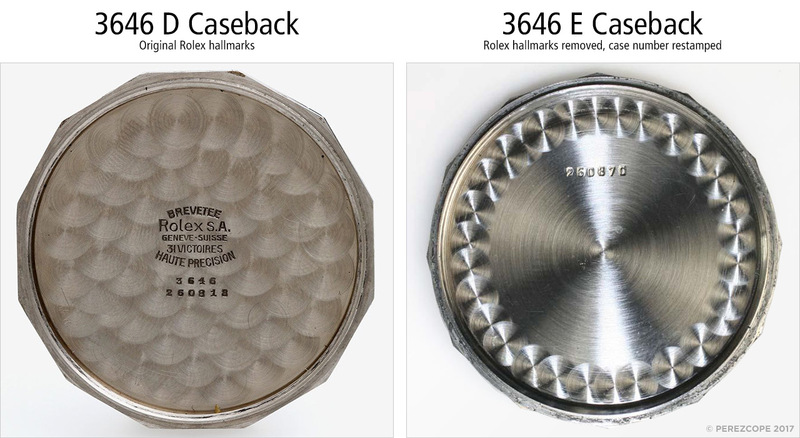 The Rolex cases had to be machined in order to take the crown-protecting device. 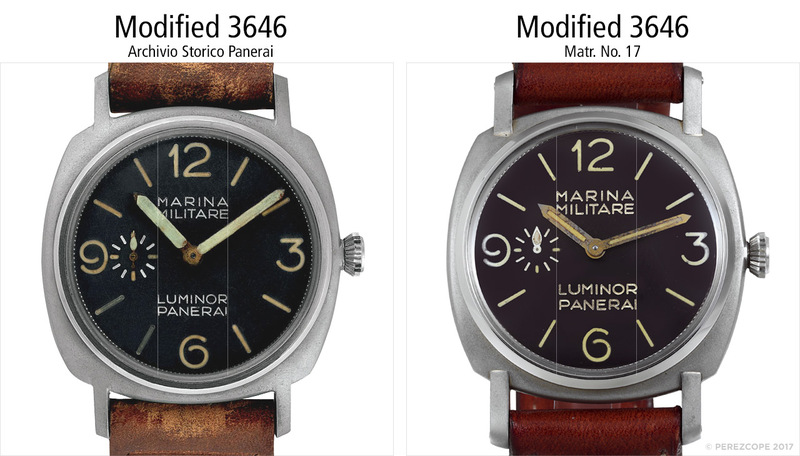 Panerai’s new lume, refered to as “Luminor”, was ready to be promoted. Ref. 6152/1 sufferend from a very low power reserve. A fully wound Cortebert 618 lasted only 36 hours. Automatic movements had become a standard in modern watchmaking and Panerai watches seemed outdated. 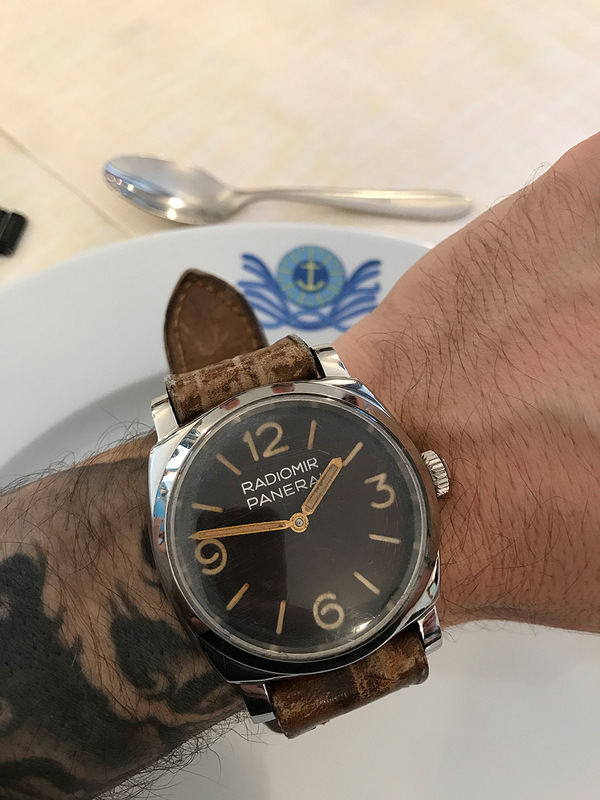 To deal with this issue and keep the Marina Militare interested in Panerai watches, Giuseppe played with the idea of replacing the “old” Cortebert 618 with Angelus 240 8-day movements. Angelus calibers were still hand-winding movements but an 8-day power reserve would definitely be seen as an improvement. The 6152/1 was designed to take a dial with a thickness of 2,5 mm. 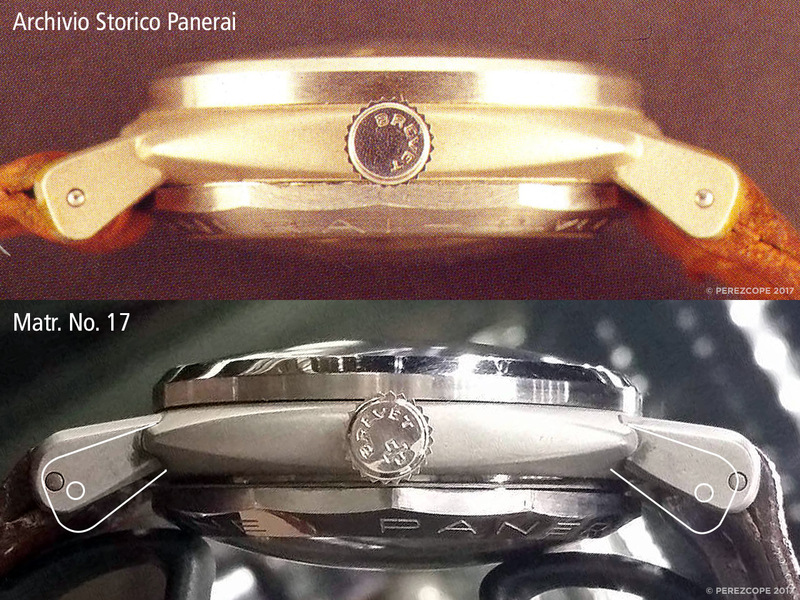 Panerai’s new dials were considerably thinner, only 1,5 mm. This made it possible to install the thicker Angelus 240 with minor modifications. For the introduction of both, the new “Luminor” dials and the Angelus 240 calibers, Giuseppe came up with a brilliant marketing idea. He still had the 3646s that he hid behind the lining of the evacuation tunnel in 1944. He decided to update these watches and present them to high ranking officers of COMSUBIN (Comando Raggruppamento Subacquei e Incursori Teseo Tesei), the Italian elite commando frogman unit. These watches would kill two birds with one stone. They would be a link to the glorious past of the Decima MAS, and at the same time a state of the art timepiece which demonstrated Panerai’s capability to supply outstanding instruments. In a first step, the old fashioned wire lugs were removed. New solid lugs were modeled and welded onto the old cases. This modification resulted in a completely different and unusual look. 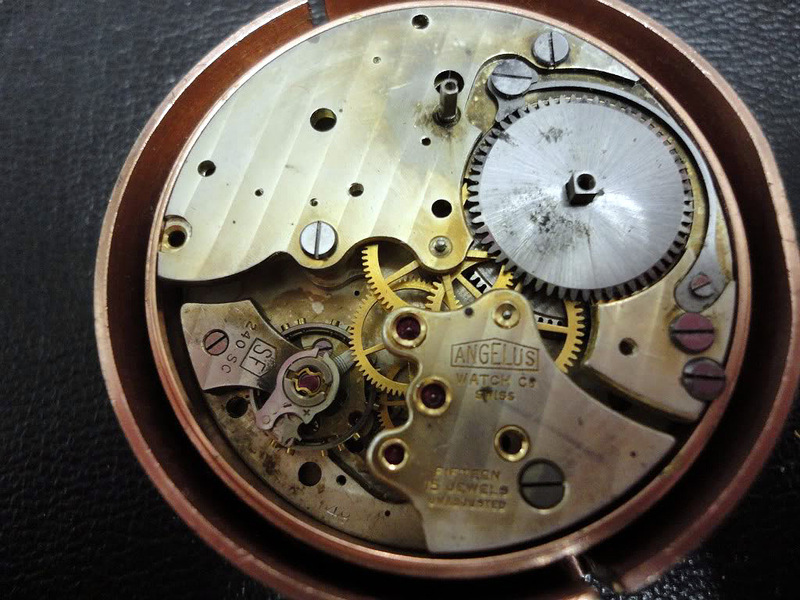 The next step was to fit an Angelus 240 movement into the 3646 case. This was kinda tricky as the final batch of 3646 watches was super slim. The middle case had been reduced to the max and was only 5,4 mm thick. Just high enough to accommodate the movement and a thin “California” dial. The Angelus 240 required a new movement ring since the existing Cortebert 618 ring would not fit. The dial had not enough clearance and the case parts could not be clamped against each other. Panerai solved the clearance problem with a higher bezel and a specially developed display caseback with a conical shape. The display window was intended to show the new 8-day movement. These watches were not meant to be used as diving equipment since water proofness could not be guaranteed due to the usuage of a display caseback. They were merely exhibition pieces to demostrate the state of the art. These watches are also known as “Transitional 3646s”. The term transitional, however, is misleading. These watches do not represent a transition of the 3646. Let’s start with the one that was found in the old Panerai archive in form of a photographic plate. 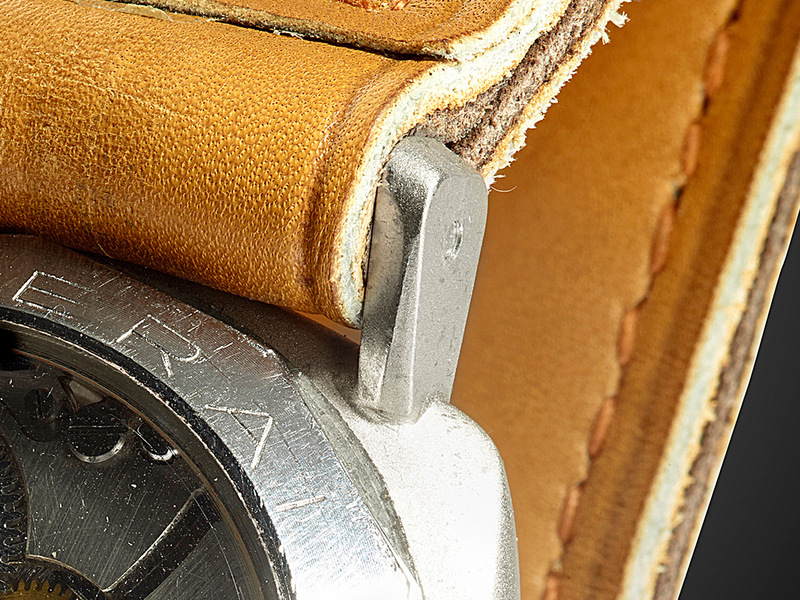 During the late 1950s/early 1960s, Giuseppe Panerai began to document every product that had been produced in-house. Watches, Instruments and many other items were photographed and archived. There are dozens of photographic plates that have never been published. This watch was probably one of the first examples ever made. The dial has very uncommon engravings. The “knurled” ring which is visible between bezel and dial is most certainly a washer spring that holds the dial in place. Angelus 240 movements were developed for alarm clocks and had no dial-feet screws to secure a dial. Another detail that is worth mentioning is the Rolex crown No. 11 without the typical Swiss cross. This was probably a service crown from the 1960s. The gaskets inside the original crowns had become hard and brittle after all the years in storage. 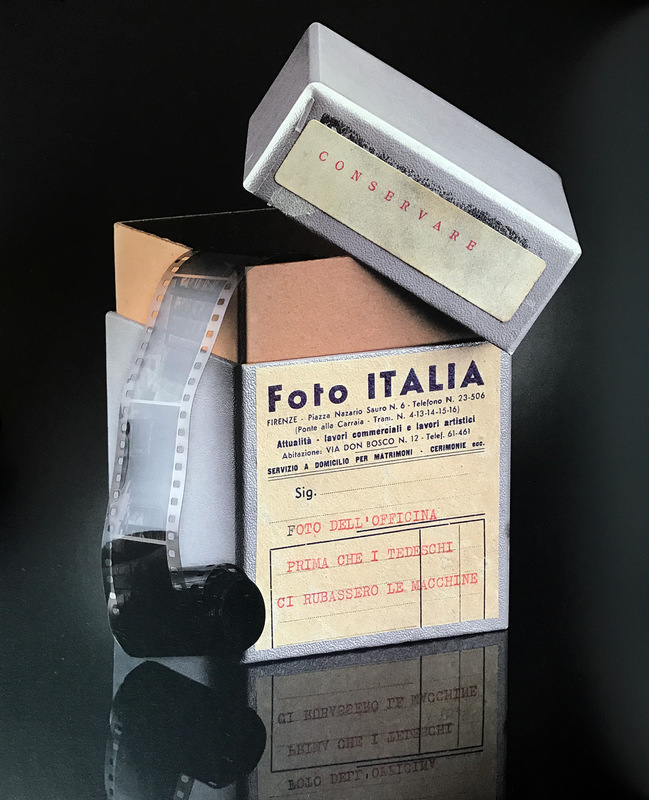 Photoprint from the original photographic plate found in the G. Panerai e Figlio archive. The matte look of the middle case was achieved through sandblasting, which was likely incorporated to hide the welding marks and avoid reflections. Recent claims that these cases feature a grey anti-reflective coating are not true. An interesting observation is how flush the welded lugs are with the top of the middle case. The second watch I would like to talk about was part of the vintage lot consisting of watches, depth gauges and compasses that was passed on to Cartier/Vendôme in 1997, when the old Officine Panerai brand was taken over. This piece is one of the most important watches in the Archivio Storico Panerai and was exhibited at official Panerai exhibitions around the world. This watch was on display in the old exhibition room in the Villino Panerai in Florence. The hands were probably relumed over the entire surface in order to achieve a higher luminosity. 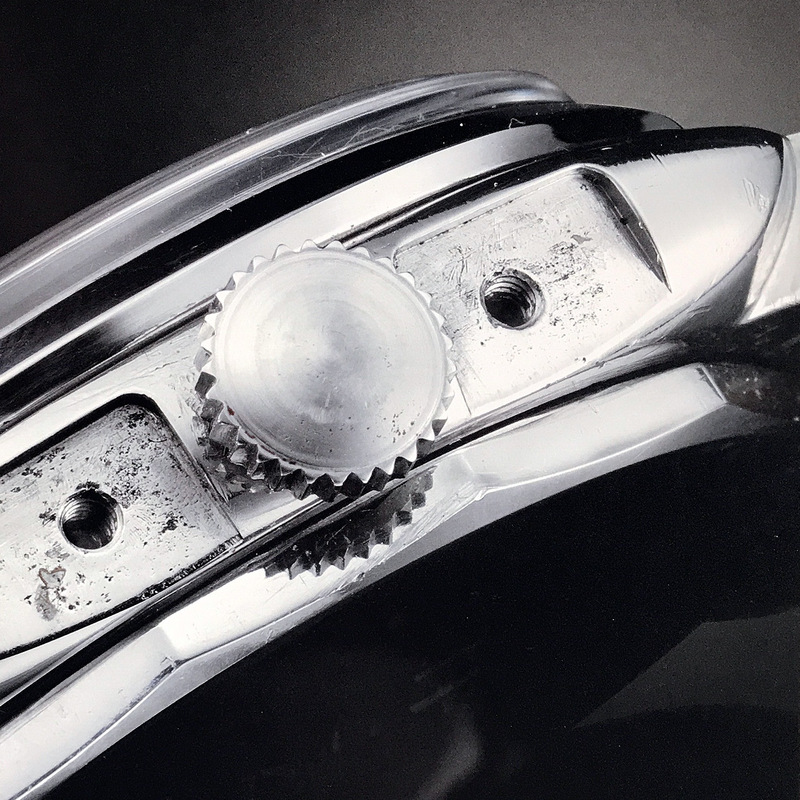 The “knurled” washer ring between bezel and dial is also present on this watch. The following profile view shows how flush the lugs are with the top side of middle case. This is a detail that absolutely matches the lugs from the photographic plate found in the old archive. It is worth mentioning at this point that the lugs on other examples are protruding significantly. But more on this later. The sandblasted surface of the middle case is clearly visible. The following image shows the display caseback exhibiting the high grade Angelus 240 movement with 17 jewels and Glucidur balance wheel. These movements with the typical brushed finish on the bridges are marked 12.55 (Dec. 1955) and were produced by Stolz Freres in Le Locle on special request of Panerai. The 12.55 series was intended for the GPF 2/56. Angelus 240 movements produced between 1947 and 1956 were equipped with the Incastar system which allowed a micro regulation and at the same time incorporated the Incabloc shock protection. Matr. No. 2 surfaced approximately 1 year ago at the P Day in Berlin. I later learned the watch belonged to a precision mechanic who used to repair watches and instruments at the Marina Militare Arsenale in La Spezia. 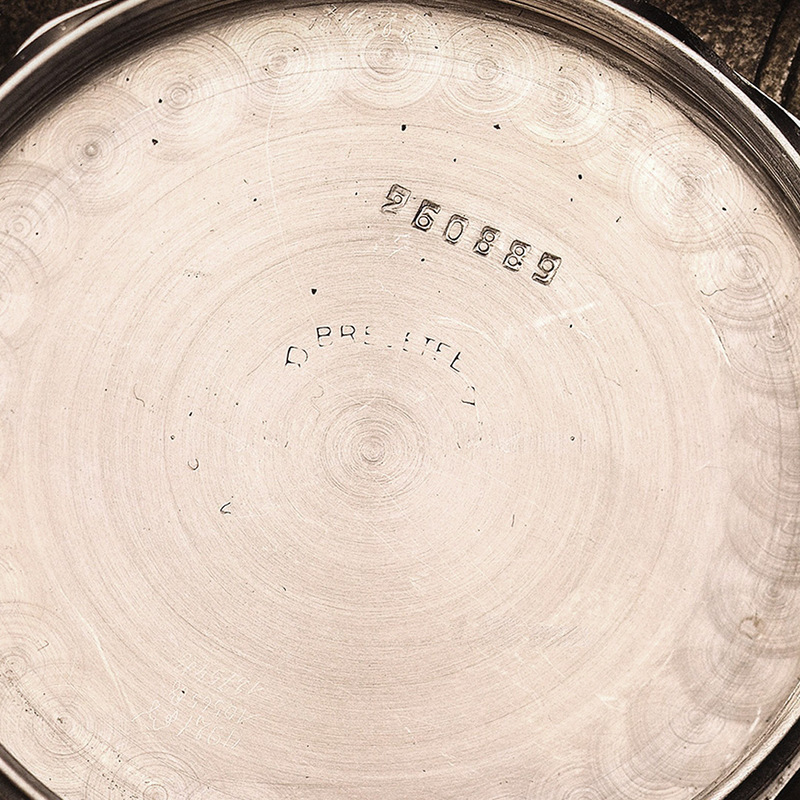 The most interesting detail of this watch is the inscription on the dial. This watch has the very same “Officine Panerai” engravings as the watch on the photographic plate found in the old Panerai archive. The “Marina Militare” inscription is not engraved. It is painted onto the dial and was probably added before it was presented to the Marina Militare. This watch doesn’t have the “knurled” washer ring. It was probably lost. The lugs of this exceptional piece are also completely flush with the top side of the middle case, just like the previous two examples. The following picture shows the case profile and the crown, a Rolex crown No. 11 without the usual Swiss cross. The middle case of this particular watch was measured at my request. The height is 5,4 mm. The Angelus caliber installed in this watch is from the very first Angelus 240 series produced on specific request of G. Panerai e Figlio. It is marked 12.55, just like the one in the Archivio Storico Panerai. 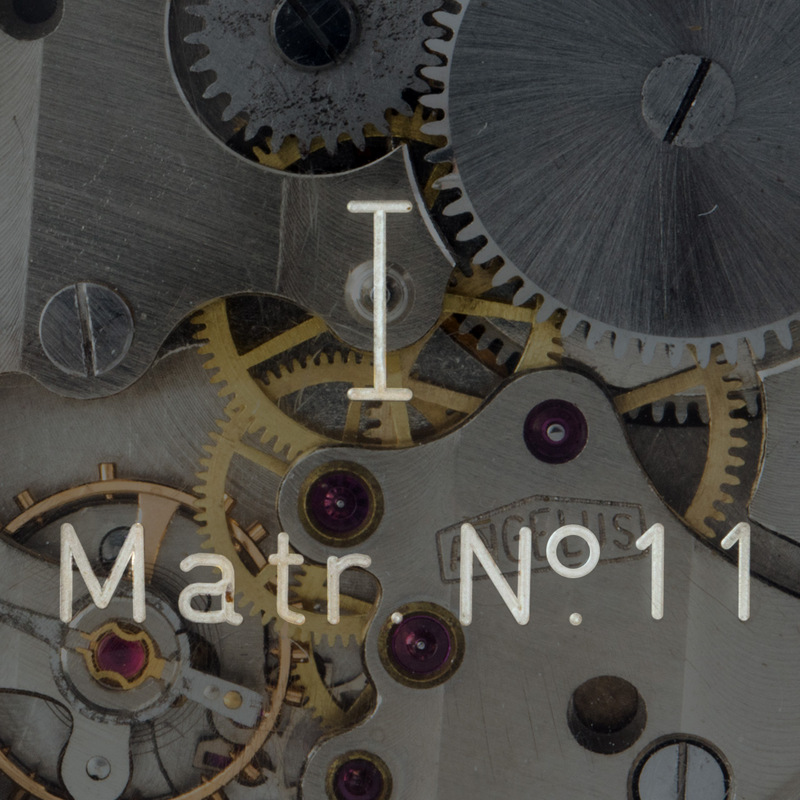 The display caseback of this watch has a matriculation number “Matr. No. 2”. It is the lowest known until today. Besides the matriculation number there is also a large “I” in the center of the crystal. This could either be a No. 1 from the Roman numeric system or the letter “I”. Matr. No. 11 used to be the lowest known example of a modified 3646 with solid lugs. The dial with “Luminor Panerai” engravings is quite common compared to the previous watches. 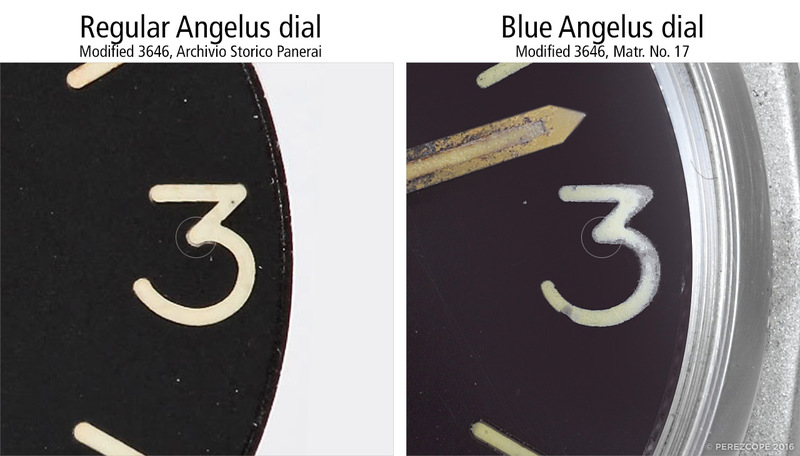 This type of dial was used in later 6152/1 that were delivered with Angelus 240 movements. After the modified 3646 with solid lugs series (Matr. No. 1 to 30) there is series of modified 6152/1 with display caseback and matriculation numbers (Matr. No. 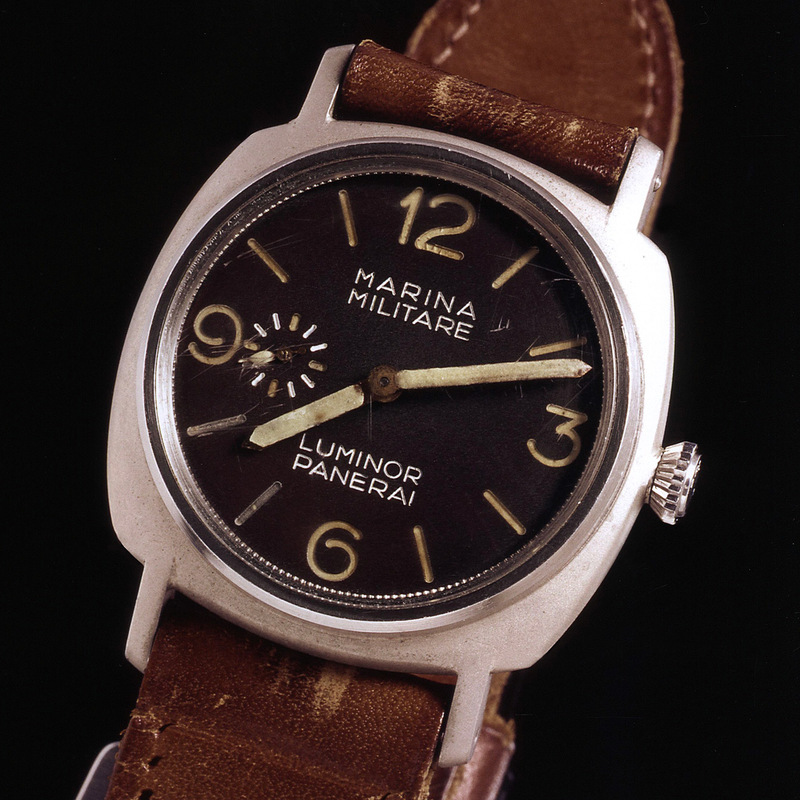 31 to 57), mostly with four-liner dials (Marina Militare – Luminor Panerai), which were also used for presentation purposes. The lugs on this watch are not incorporated as nicely as on previous examples. The shape of the lugs is still the same but the welding is not well executed. This could be an indication that this particular case was either an early test or a reject. The following comparison illustrates how roughly the welding was executed on Matr. No. 11. This watch features a completely different crown than the previous watches, a Rolex crown No. 13. The matriculation number of this watch is “Matr. No. 11”. The center of the plexi features an “I”. So far, nobody was able to figure out what the “I” stands for. Matr. No. 11 is equipped with a later version of the Angelus 240 which is adorned with Côtes de Genève instead of the simple brushing. This movement is marked JUIN.61 (June 1961) and belongs to the last of 3 series of movements that were specifically assembled by Stolz Freres for Panerai. 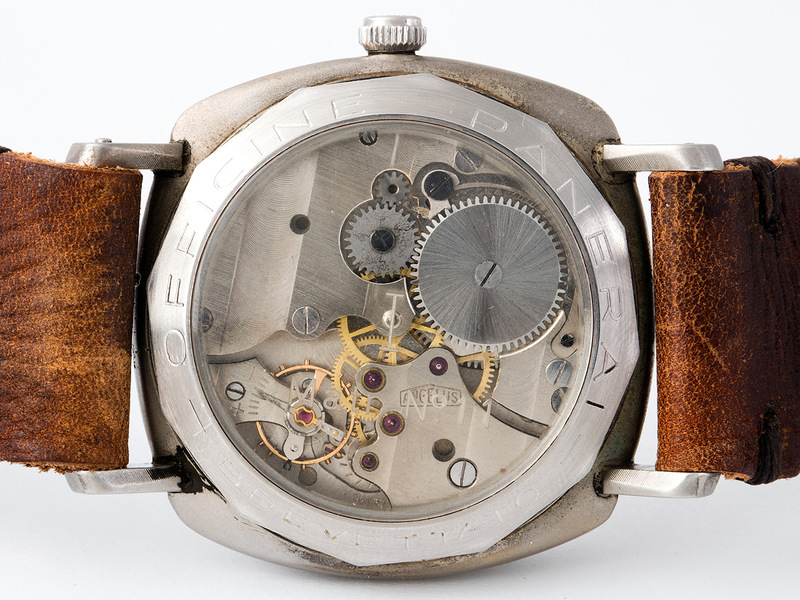 Most modified 6152/1 with display caseback and four-liner dial, the 6152/1 equivalent for presentation purposes, are equipped with Angelus 240 that are marked MAI.61 (May 1961). 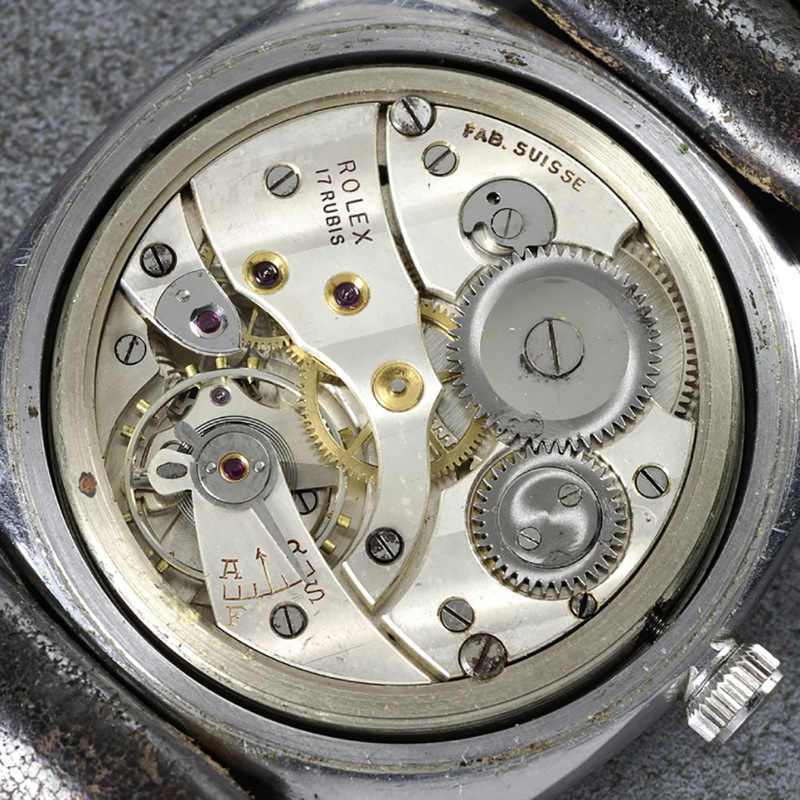 JUIN.61 movements were mostly used in 6152/1 of the regular series with closed caseback and Luminor Panerai dial. Matr. No. 17 was on display at the “History and Legend” exhibition in Singapore. This official Panerai event took place from August 27 to September 6, 2015 and was “apparently” dedicated to the history of the brand. I say apparently as most of the vintage watches and instruments that were displayed had incorrect dates. The watch below differs from other modified 3646 with solid lugs in many aspects. The most obvious difference is the blue dial with yellow patina. The “Marina Militare, Luminor Panerai” engravings are wider than usual. The shape of the numeral at three is different too. Short Angelus hands like this are commonly found in Angelus alarm clocks. The small seconds hand at 9 has a very unique shape. The solid lugs on this example are not as nicely integrated as on other examples, they are protuding. Let’s have a look at the case profile and compare it to the watch from the Archivio Storico Panerai. On Matr. No. 17, the lugs are welded in a much flatter angle. The shape of the lugs is different too and they are longer. All previous models are consistent. Another thing that does match is the bezel. The first three watches have an undisputable provenance and they look almost identical. Matr. No. 17 clearly stands out. 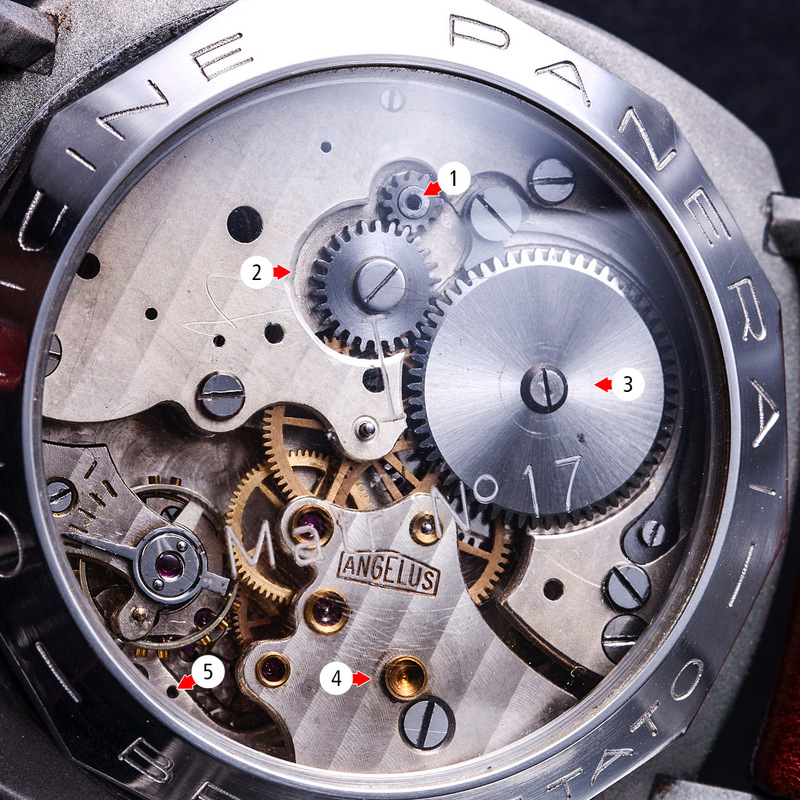 The Angelus 240 of this watch is a mess. It’s an alarm movement from a travel clock that was converted to look like a non-alarm movement. The most obvious tell is the collar on the crown wheel (1). On original non-alarm movement this wheel is completely flat. 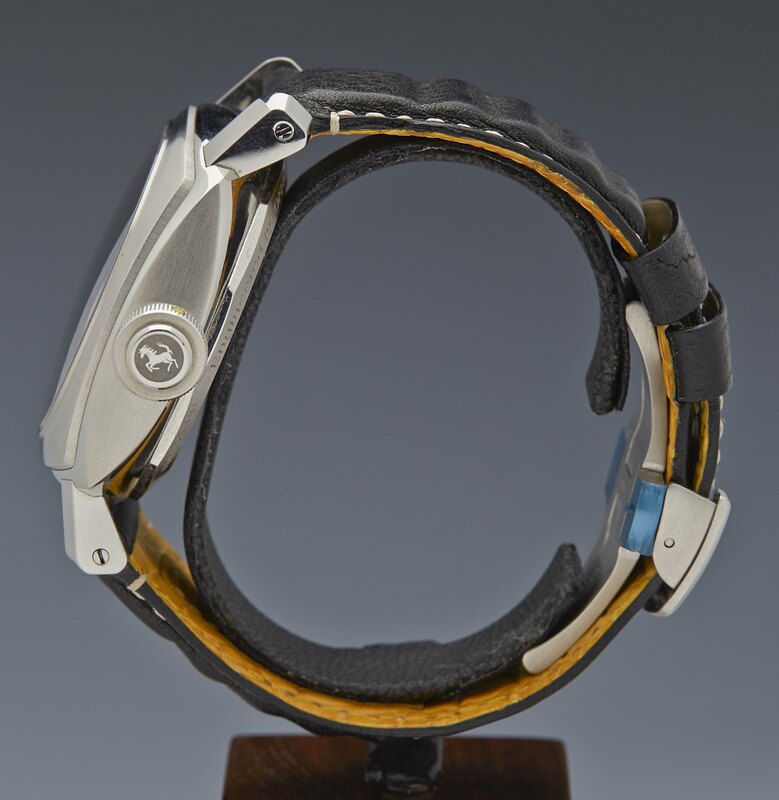 The non-alarm look was achieved by using a modified non-alarm barrel bridge from a key-winding movement. The slots for the winding wheels (2) were milled out. This bridge however, has too many holes. The ratchet wheel bears the circular scratches (3) that are usually caused by an intermediate bridge used to attach the alarm bell. The scratches around the hole for the alarm setting stem (4) can only occur on alarm movements. Finally, the extra holes (5) in the main plate are used to attach all kinds of levers on alarm movements. Non-alarm movements usually don’t have these holes. Original Panerai Angelus 240 have a Glucydur balance wheel and Incabloc shock protection. 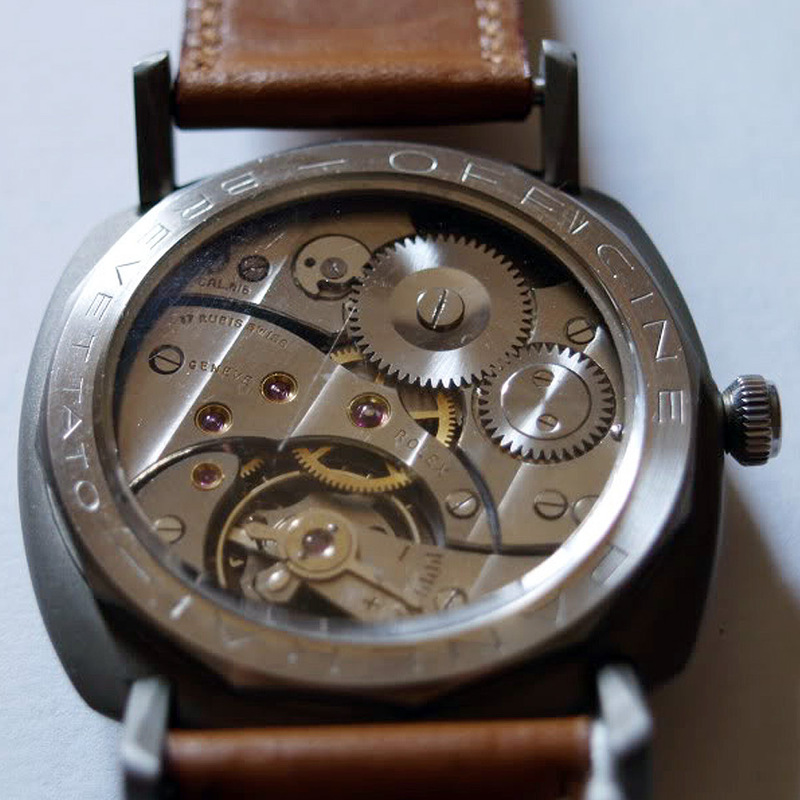 This movement has neither and is probably from 1945 to 1948, long before Panerai started to use Angelus 240 movements. Below you can see the exact same type of barrel bridge from a non-alarm key-winding movement that was used to convert the movement. The display appears to be ok, at least the metal part. The matriculation number on the plexi looks sloppy and the “I” is not centered in contrast to previous examples. Let’s go back to the dial and compare Matr. No. 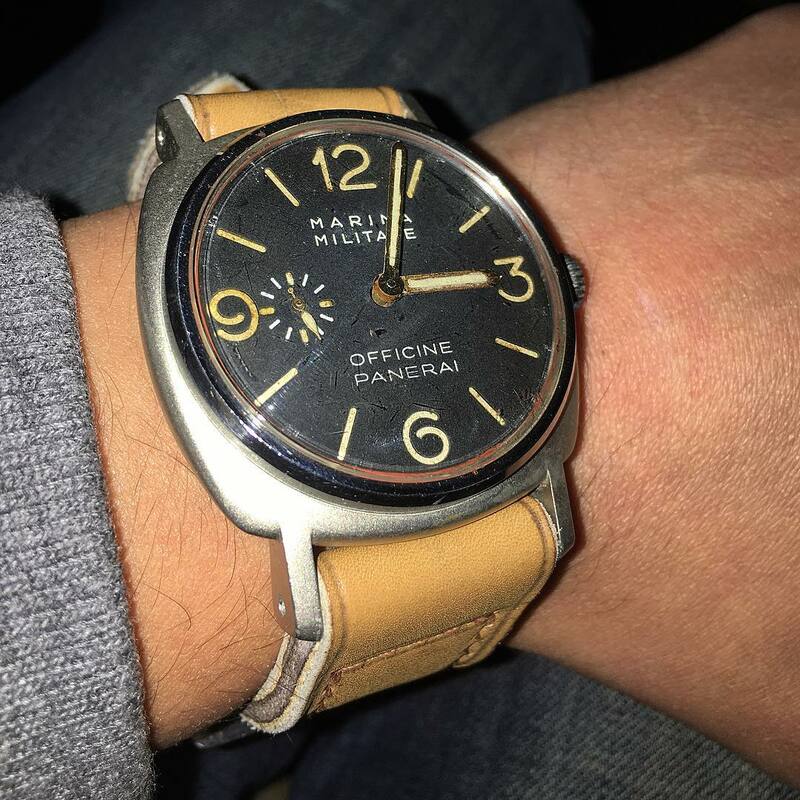 17 with the modified 3646 from the Archivio Storico Panerai. The engravings are clearly wider and much bolder on Matr. No. 17. There are other discrepancies too, the number 6 is more open on Matr. No. 17 and the number 3 has a different shape. The hands are shorter and came probably from an Angelus travel clock. In this direct comparison it becomes clear that the solid lugs on Matr. No. 17 are not only longer but also significantly thicker. 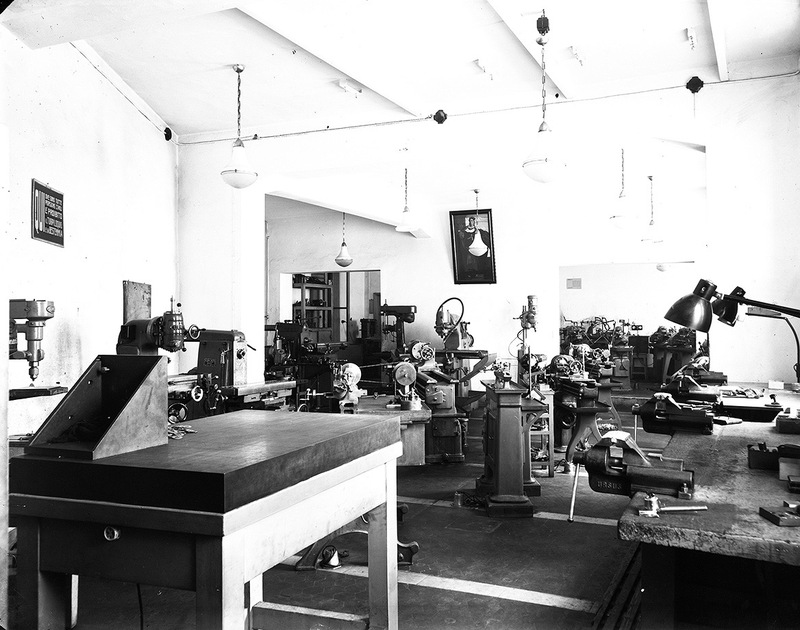 G. Panerai e Figlio was a precision mechanical workshop. The delicate dial cut-outs were mastered to perfection. This direct comparison of the numeral at 3 shows that the cut-out on Matr. No. 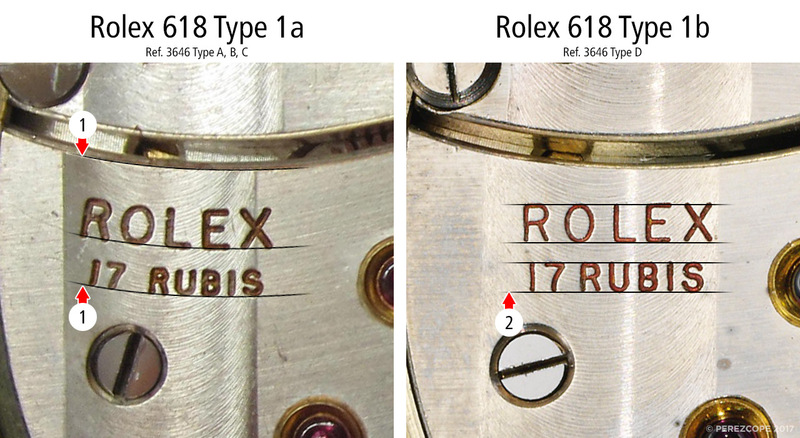 17 has a simplified shape and is not as intricate as on a regular Angelus dials. Matr. No. 17 was offered on Antiquorum in 2007, along with 6 other very questionable watches. In a joint effort of several parties, all 7 watches were withdrawn from the auction. The overwelming evidence speaks for itself in this case. It’s a shame that fakes like this are shown at official Officine Panerai events. Some parts of the watch could be original though, the case and crown for instance. To understand where this case could originate from we need to go back in time, once again. 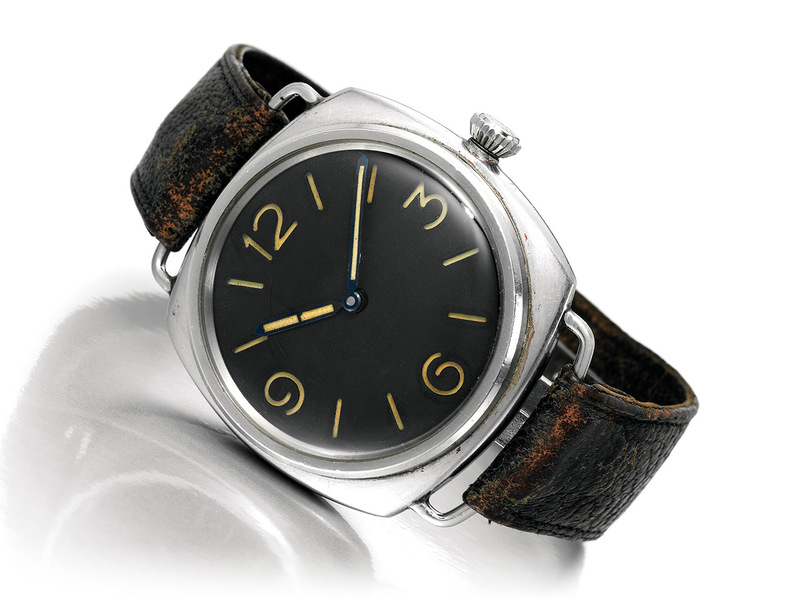 After the Nazis raided the Panerai workshop, the confiscated goods were shipped to the old watch factory Arturo Junghans SA in Venice. The Kampfschwimmers had built a secret training facility on an island not far from the factory. Many years after the war, in the early 1990s, the old Arturo Junghans premises were transformed into lofts and a theater. Around 30 NOS (New Old Stock) Ref. 3646 “California” watches and numerous dials were found in the shelfs when the warehouses were cleared. All these items ended up with the usual suspects in Tuscany. Why would someone deliberatly destroy a NOS 3646 you may ask. Well, a “transitional 3646”, as these watches used to be called, is considered a prototype and their value is double or even higher. Matr. No. 17 is one of 3 modified 3646 with similar characteristics. They all originate from the Luciano Rinaldi Toy Shop and are fake. 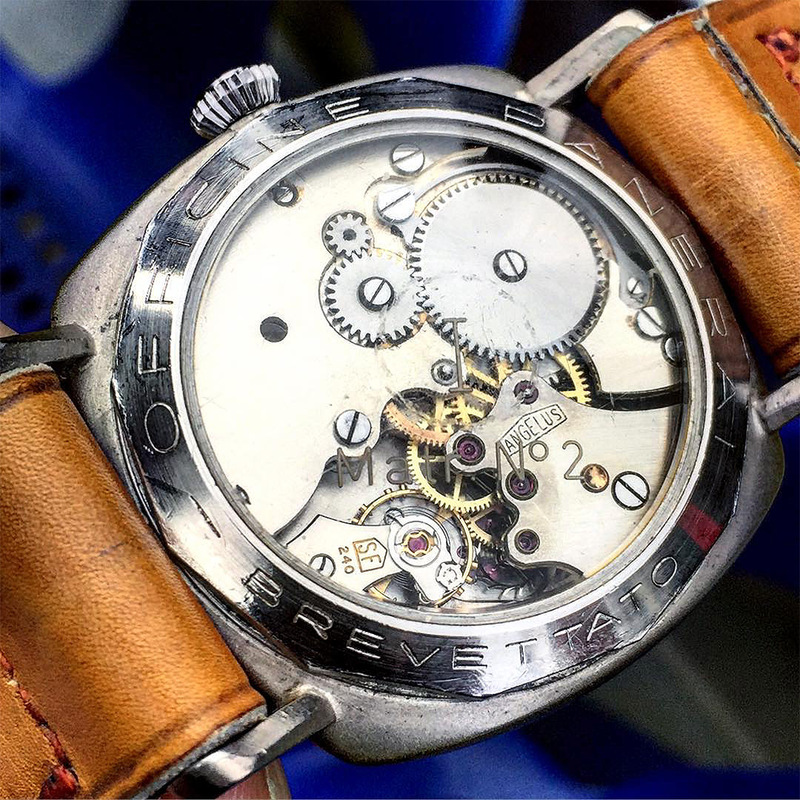 This modified 3646 with solid lugs stands out completely from the rest of the watches shown in this article. It has an experimental Radiomir dial with a minute track formed by dots. 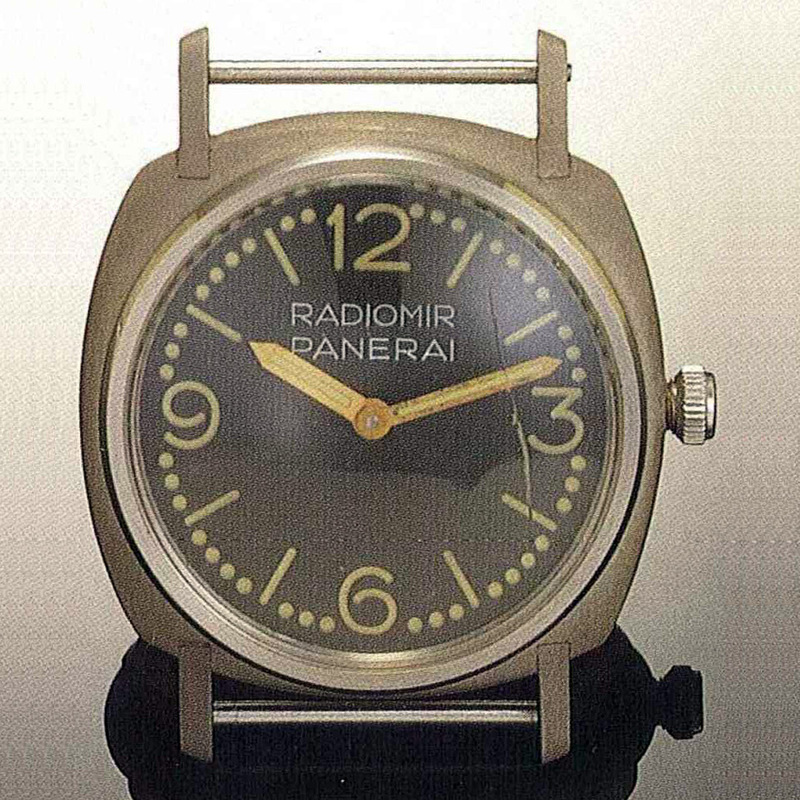 This type of dial exists with Radiomir as well as Luminor engravings. The Luminor version is installed in a 6152/1 that belongs to Maria Teresa Panerai. This watch was auctioned by Antiquorum on April 22, 1995 for CHF 6,900.00 (Swiss Francs). The movement of this watch is a Cortebert 616, not the usual 618. Cal. 616 and 618 are basically the same caliber, only the shape of the bridges is different. The caliber number “Cal. 616” is engraved on the barrel bridge of this movement (left side). The Côtes de Genève do not match. This becomes visible in the area where barrel, train gear, and balance bridge meet and is an indication that the movement was assembled from part of different time periods. It is difficult to say wehether the Rolex engravings are genuine or not. The crown appears to be a Rolex crown No. 13. 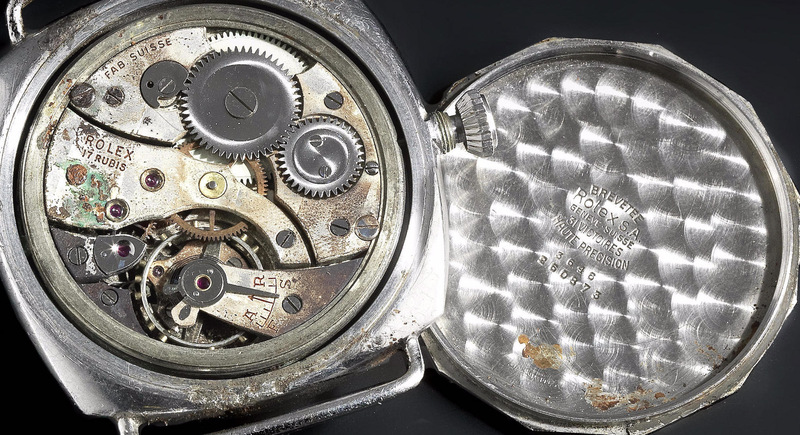 The open exhibition caseback of this watch is the flat version, which was probably obtained by machining an original 3646 caseback. The comparison below shows the different bridge layouts between Cortebert 616 and 618. The “I” on the open exhibition casebacks has always been mystery. I’ve read it could stand for “Incursore”, the Italian word for assaulter, or for “Italia”. Neither of this makes really sense. I believe the “I” needs to be understood in combination with the “Officine Panerai Brevettato” engravings on the metal ring. “Brevettato” is Italian for patented. The only thing that was patented by Panerai in relation to these watches was the name of the luminous paste “Luminor”. If we look at the early “Luminor Tipo I” jar found in the Villino Panerai, we see an “I” that is very similar to the one on the display plexi crystal. It was not common for Panerai to use Roman numerals, therefore we can assume it stands for the letter “I”. Since these modified 3646 with solid lugs were all about the introduction of “Luminor”, it would make perfect sense that the “I” had something to do with “Luminor”. Following this logic, the “I” could stand for “Innocuo”, the Italian word for harmless. This term was commonly used in relation to tritium lume. This article wouldn’t be complete without the mentioning of Officine Panerai’s partnership with Ferrari. In 2005, Panerai released the first Ferrari model. The case of this watch was clearly inspired by the modified 3646 with solid lugs. Some collectors have therefore nicknamed the modified 3646 with solid lugs “Il Ferrari”. Panerai’s prestigious partnership with Ferrari ended after only 5 years and around 20 different watch models. Modified 3646 with solid lugs, so-called “transitional 3646”, are exceptionally rare. Of the around 30 pieces made, only a few survived. These watches were not meant to be used as diving equipment, due to the open exhibition caseback. Most were probably nevertheless used to swim and they all ended up suffering the same fate. Today, there are only 2 or 3 pieces that can be considered absolutely original. An official COMSUBIN inventory document from 1988 lists at least 3 modified 3646 with solid lugs. Matr. No. 5, 11 and 21. The dial inscription of these watches is listed as “Marina Militare”. Modified Ref. 3646 watches with solid lugs and Angelus 240 movement represent something like the culmination of all things Panerai, together with later modified Ref. 6152/1 watches. They are the perfect mix of amazing Rolex timepieces paired with the ingenuity of Giuseppe Panerai. Officine Panerai should take a true re-edition of these extraordinary pieces into consideration. A well done replica with sandblasted case and meticulously replicated dial would be a hit. I hope you enjoyed this article. 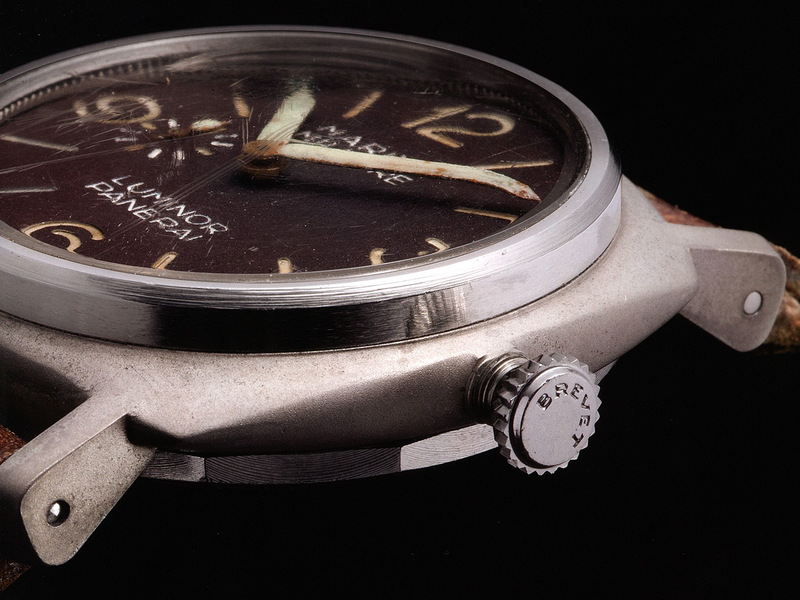 Perezcope will be back soon with a comprehensive examination of the super rare blue “Panerai” dials. I would like to thank: Maria Teresa Panerai, Jake Ehrlich and Mario Paci for their invaluable contributions. Modified 3646 watches with solid lugs and Angelus 240 movements are a milestone in Panerai’s amazing history. Please click the following graphic to download the highres version. Absolutely perfect story! well written, superbly researched! Congratulations!!! Perfect research!! Perfectly written!!! Congratulations!!! Any thoughts on Lot 16 from upcoming Phillips Winning Icons auction in NYC? (Apologies for the general nature of the question). Hi Baruch, thank you very much for your kind words! I am glad you got interested in Panerai. In terms of exciting history, there is nothing comparable, not even close. Lot 16 is a great watch. The only issue is the Rolex signature on the movement. This was added later, probably during the 1980/90s. This type of watch is supposed to be completely anonymous. I find it interesting that neither the Rolex signature dating or the reasons for the introduction of the California dial have made it into the catalogue description. Perhaps they are innocent omissions.